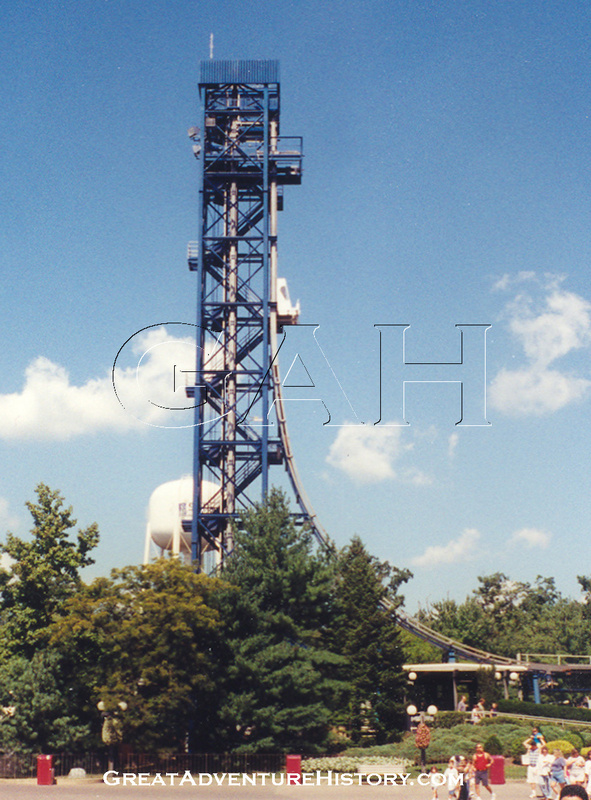 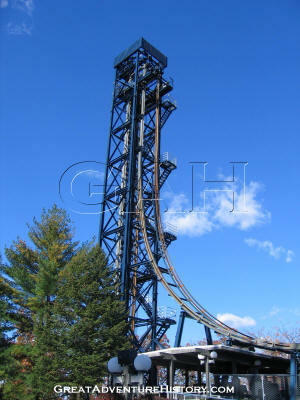 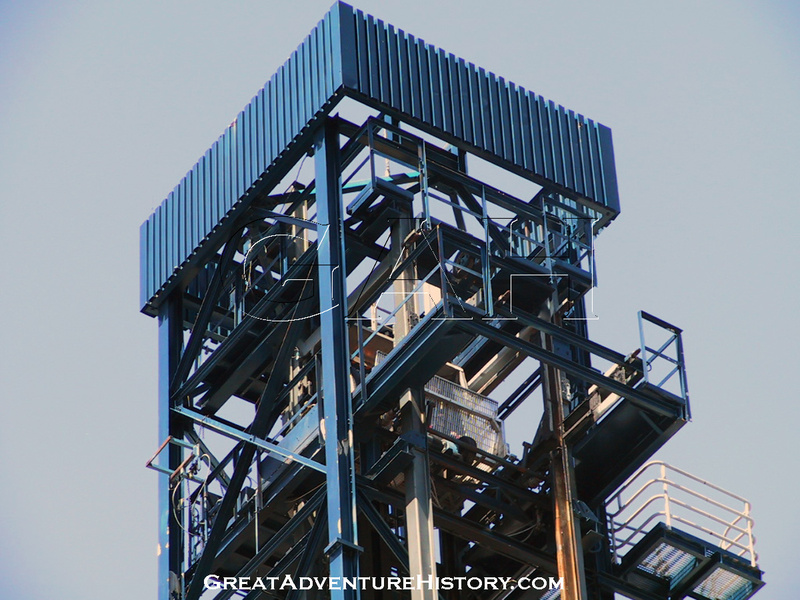 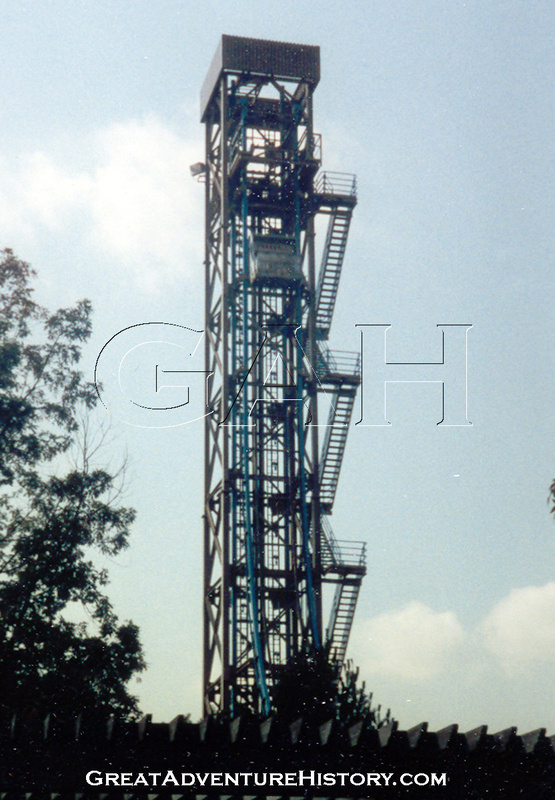 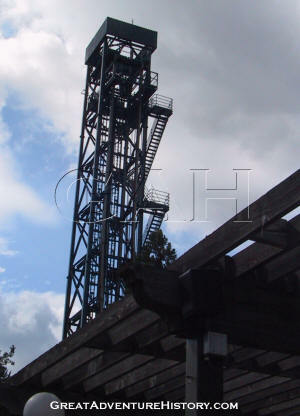 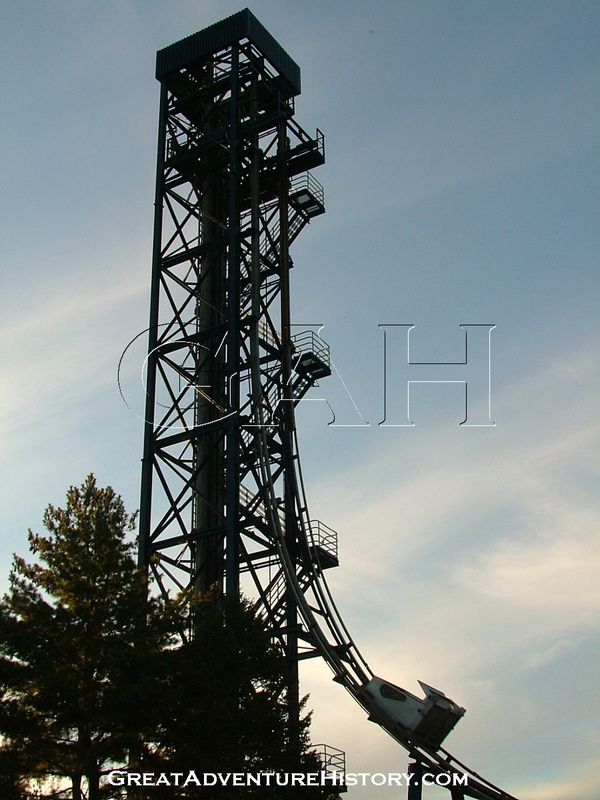 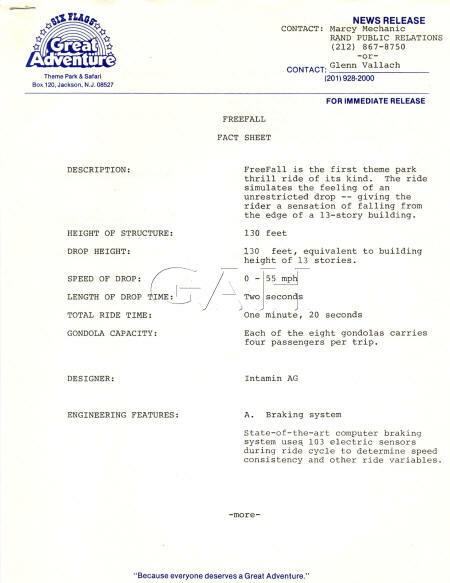 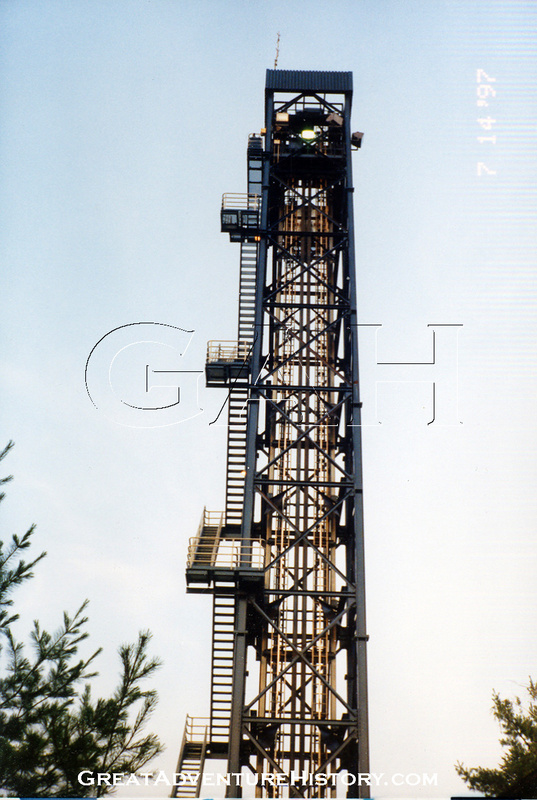 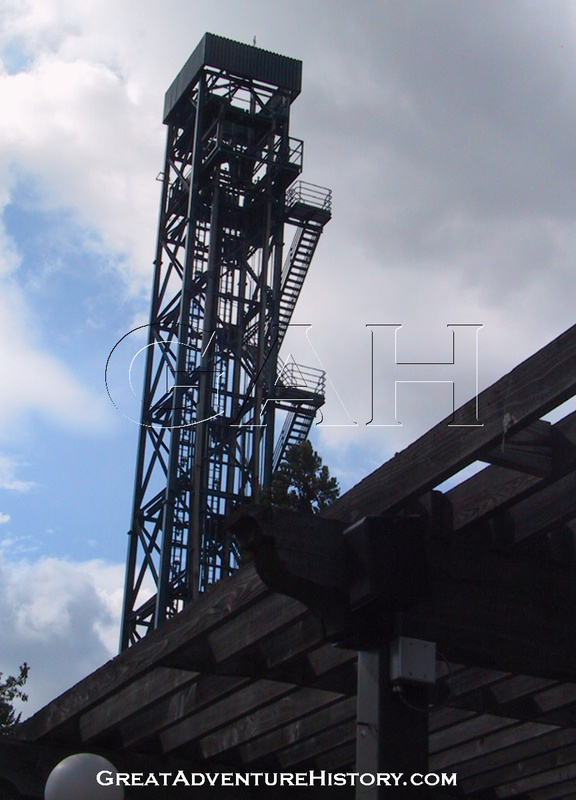 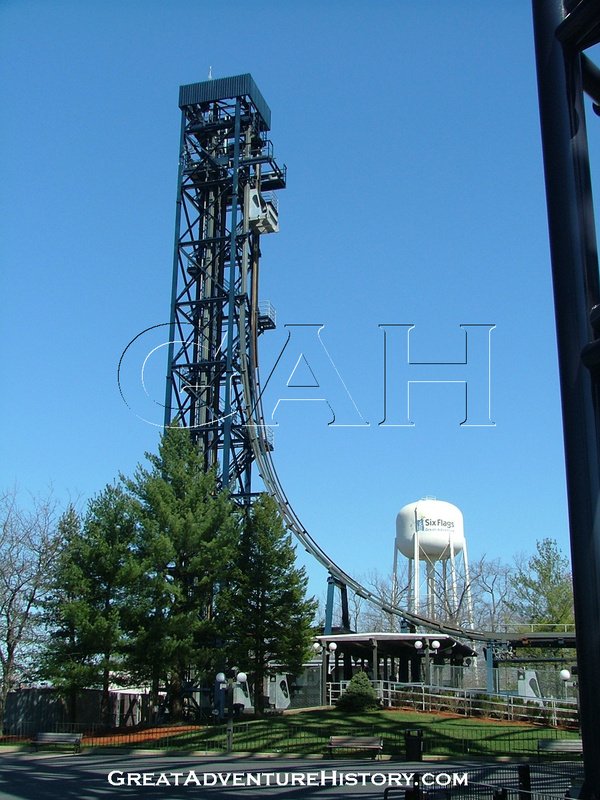 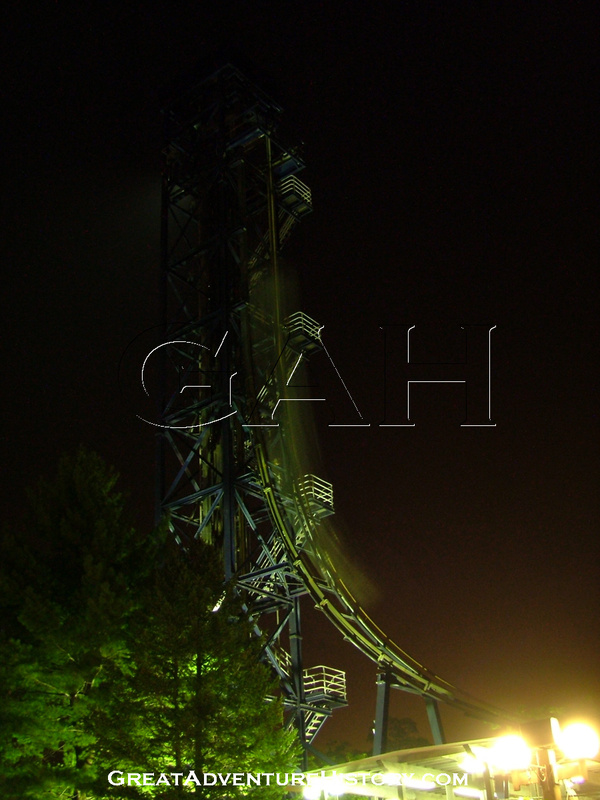 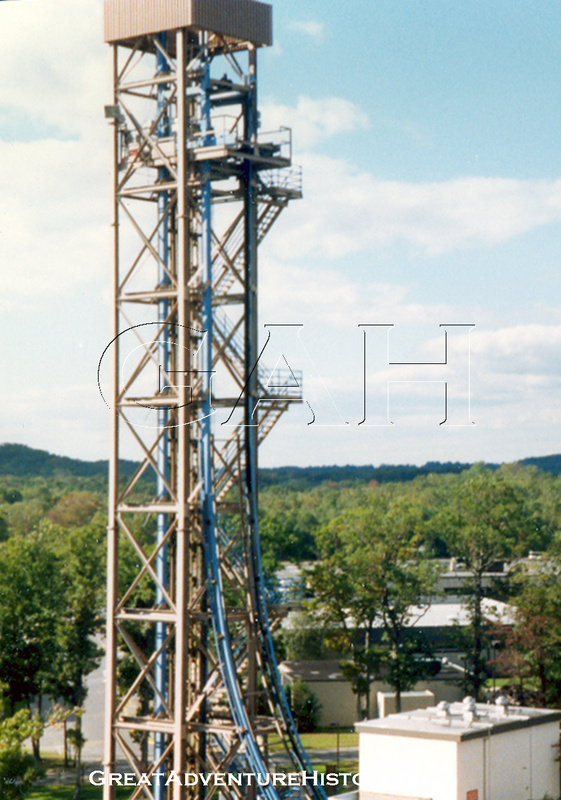 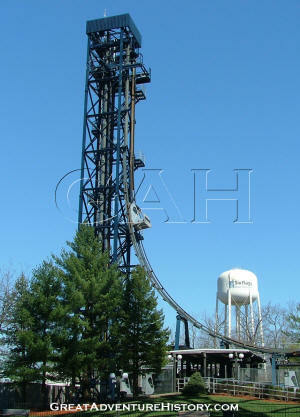 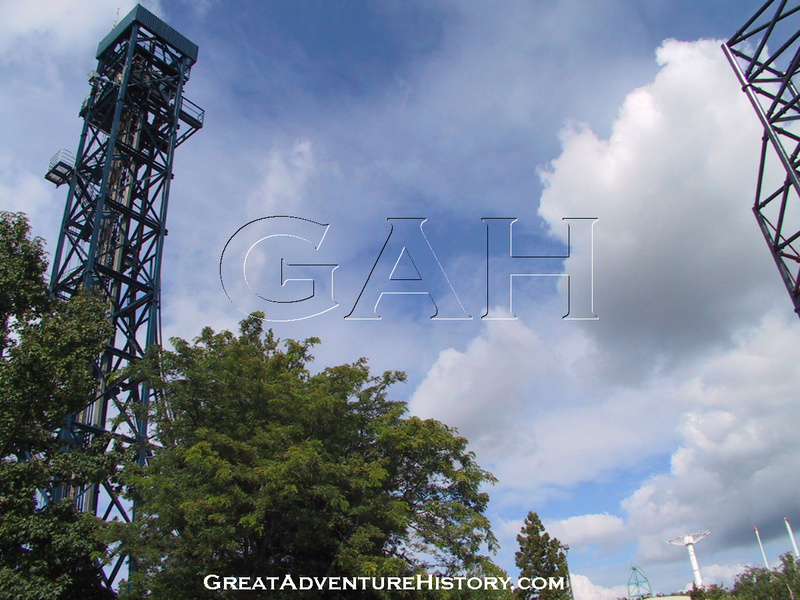 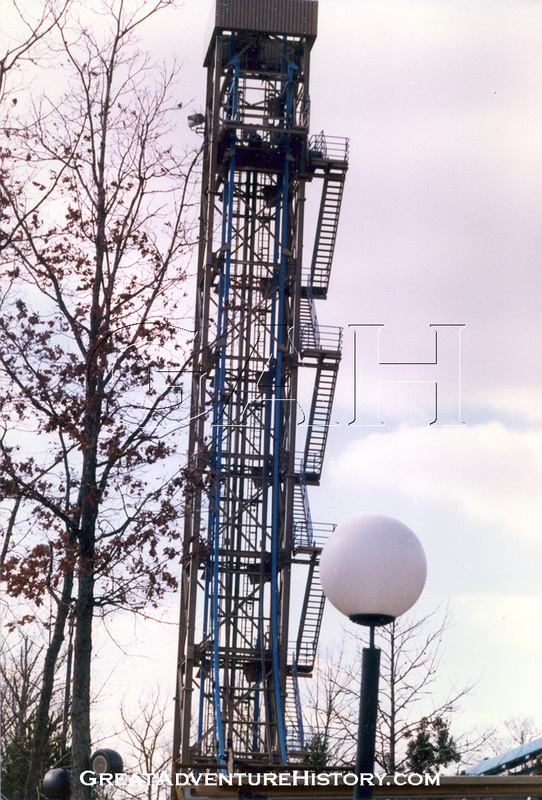 Designed by INTAMIN, the first generation freefall ride offered one of the first true free fall experience, with an unfettered drop from a height of 130 feet. The ride was short, but offered a truly terrifying experience as the anticipation of the drop built. Though by today's standards first generation freefall rides are relatively tame, they were a standard of theme parks around the country for many years. 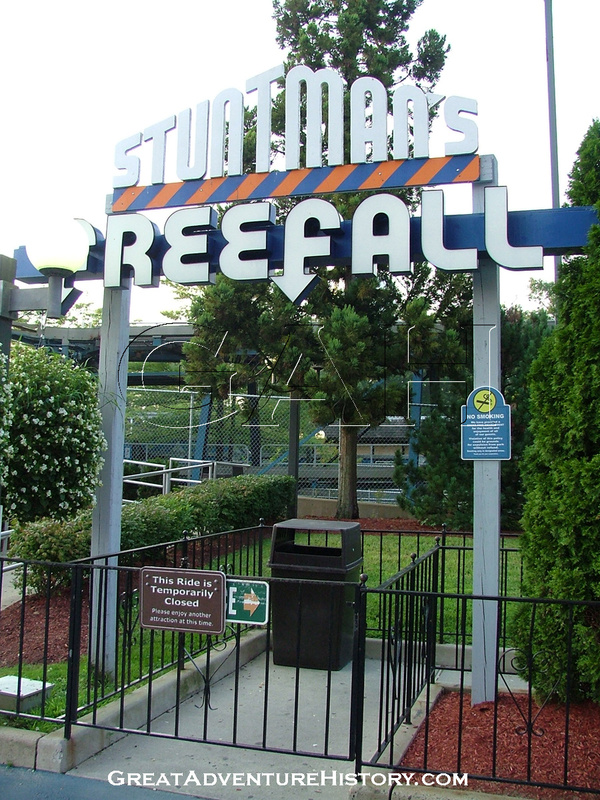 Today the rides are becoming more scarce as bigger and more thrilling drop rides have been added to parks which offer more of the freefall sensation with less of the mechanical wear and tear. 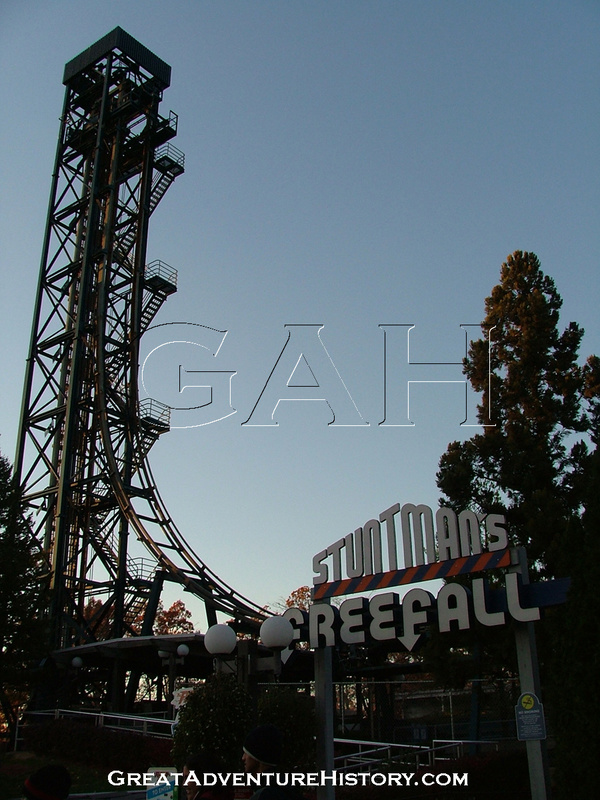 Always looking to be on the cutting edge of thrill rides, Six Flags turned to INTAMIN for something that was new and exciting, and never seen before. 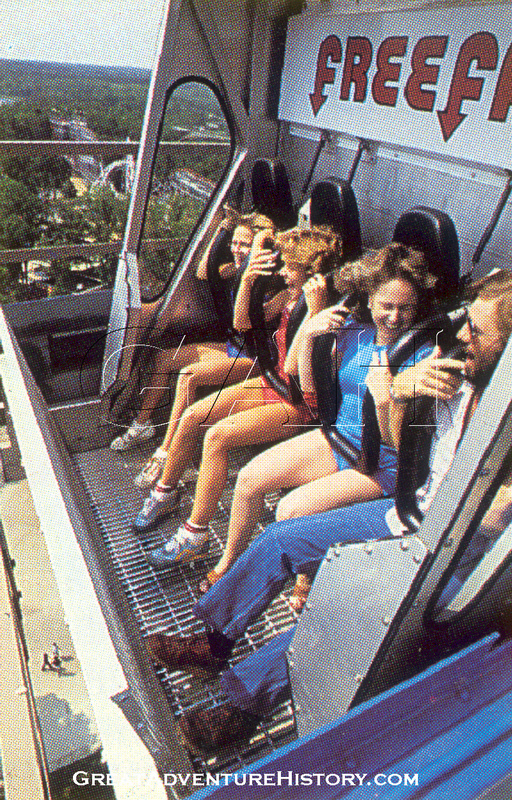 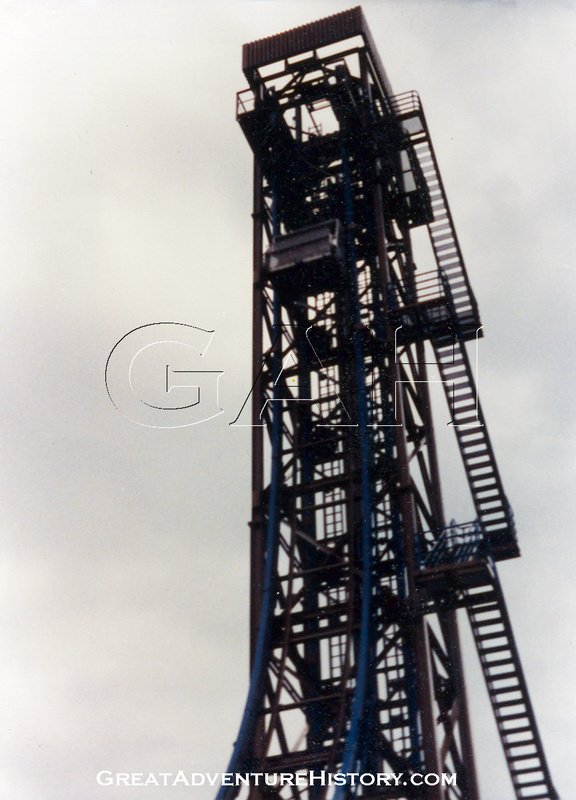 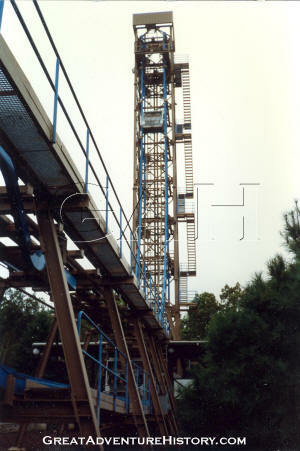 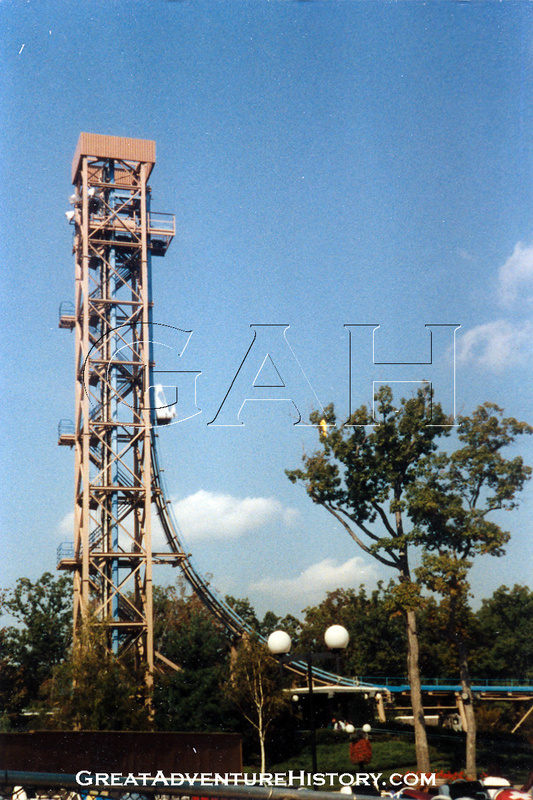 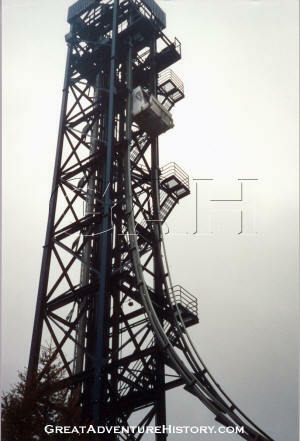 The first of the Freefall rides were installed at Six Flags Over Texas and Magic Mountain for the 1982 season and proved to be such a hit, they were added to the rest of the Six Flags properties the following season. 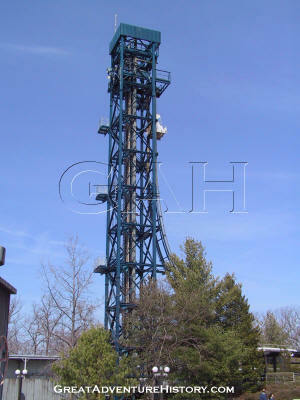 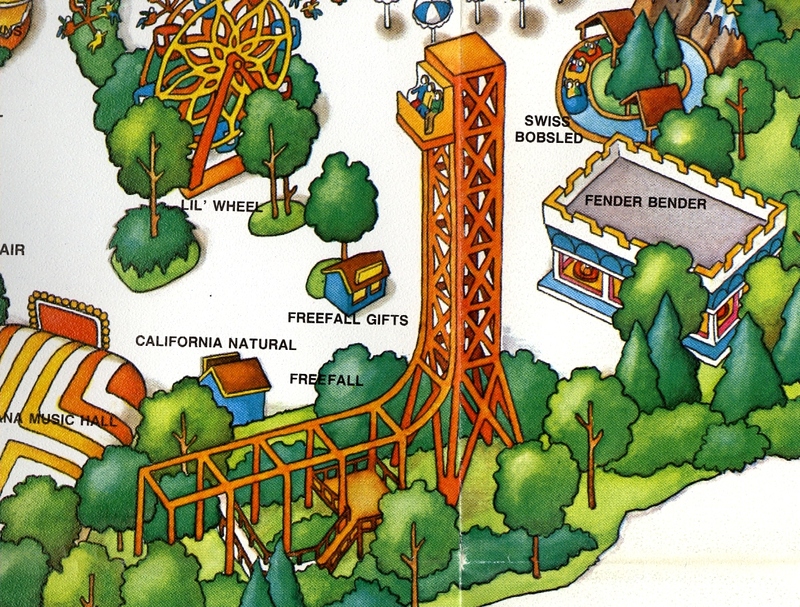 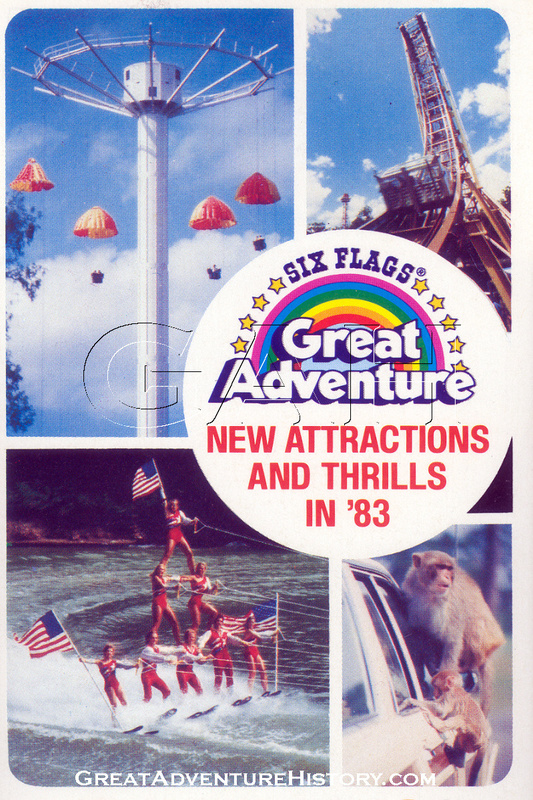 The original ride's orange and yellow towers were often used in brochures and advertising for Six Flags parks. 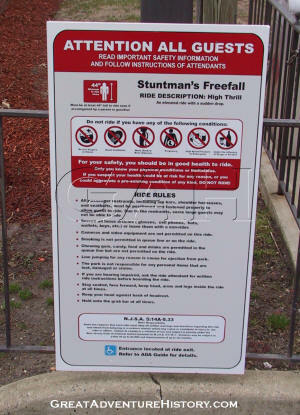 The company developed an award winning ad campaign featuring stuntman Dar Robinson performing a jump from a tall building and landing in an air bag, with the line "What's it like to jump from a 13 story building?". The ad was part of popular culture at the time and was even spoofed on morning radio shows. 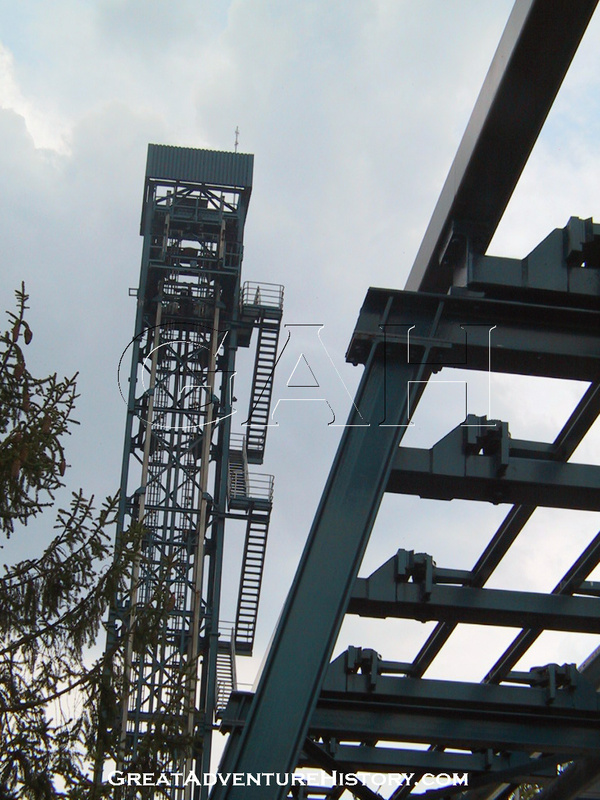 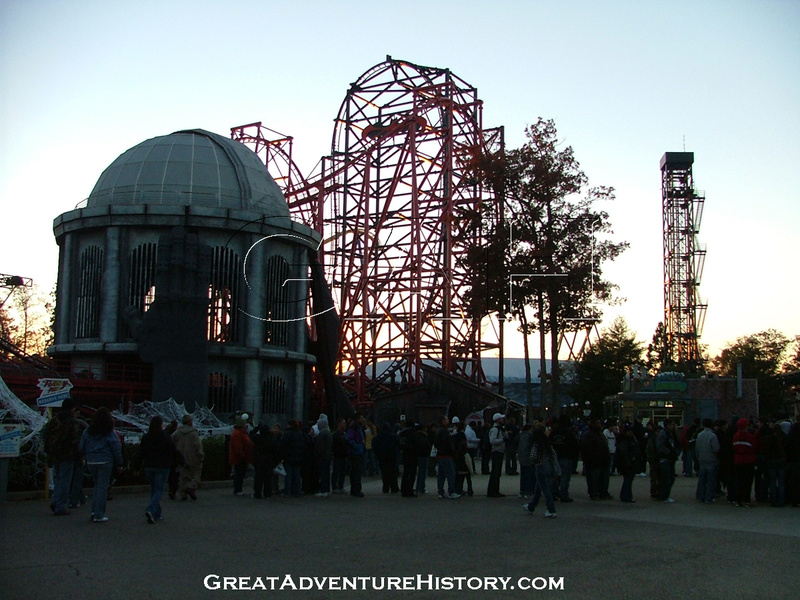 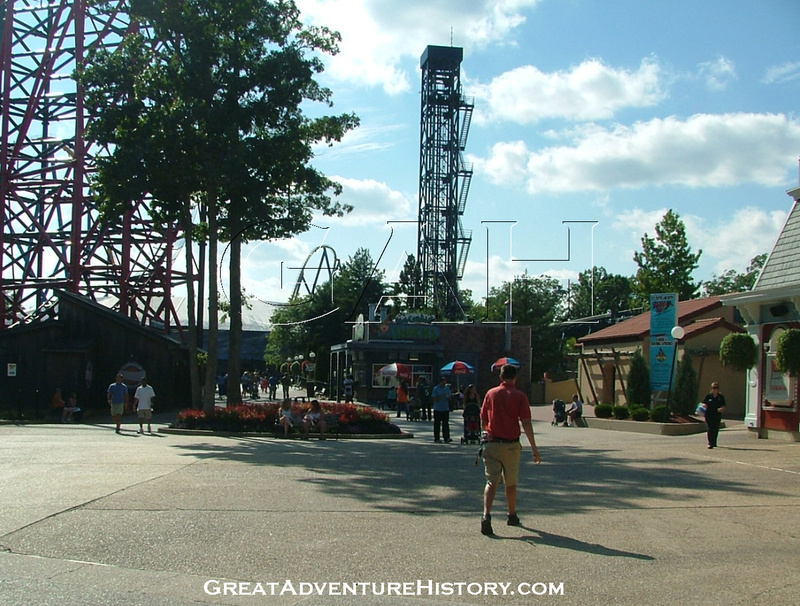 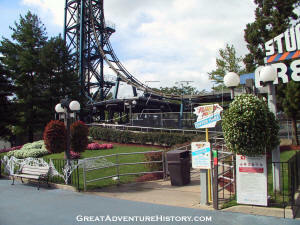 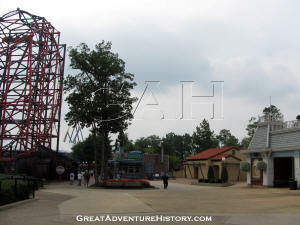 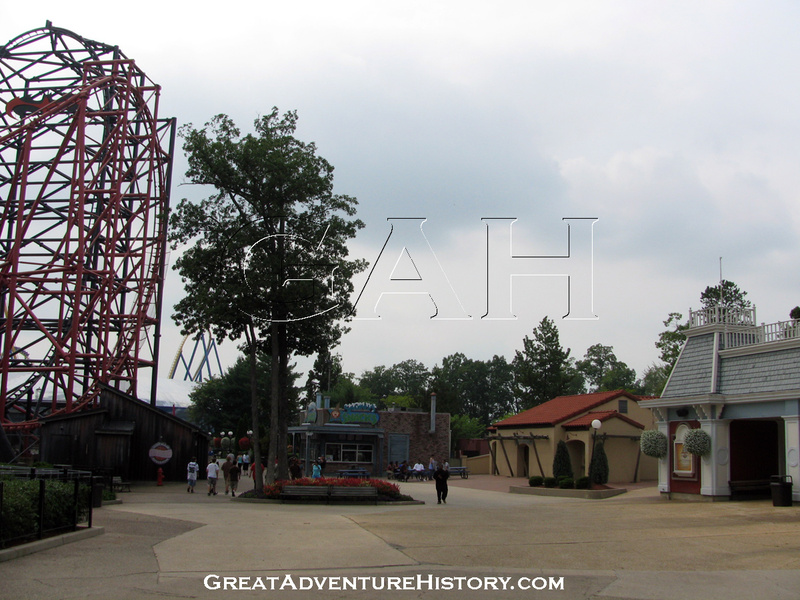 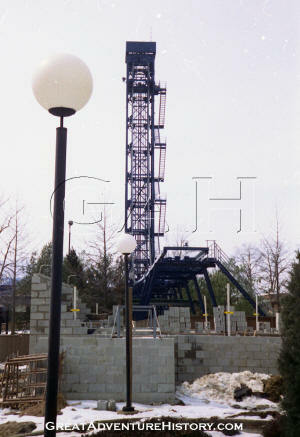 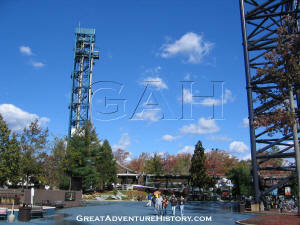 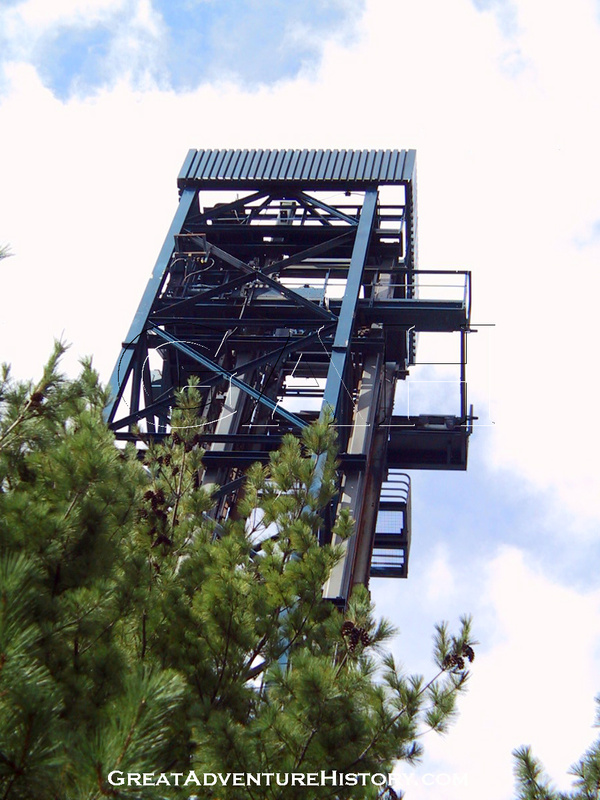 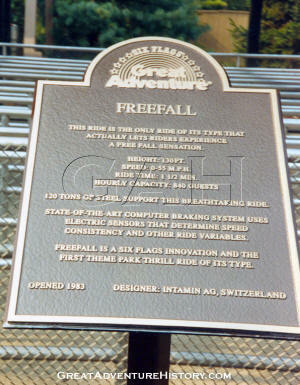 Freefall was built on the site of three attractions which were removed or relocated. 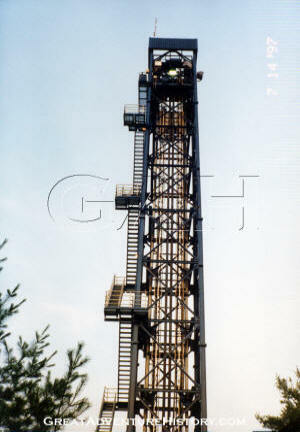 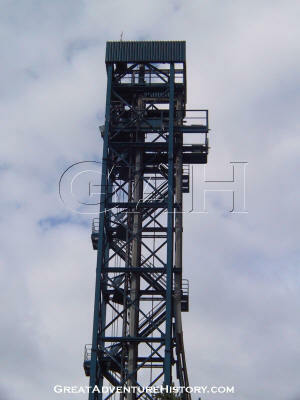 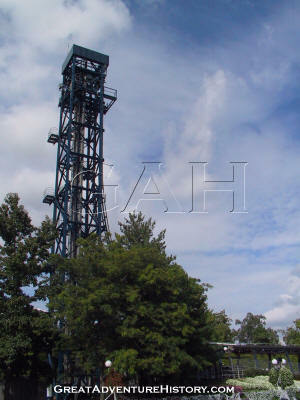 The Rotor was relocated to the site of the Rail Road which had been removed two seasons earlier. 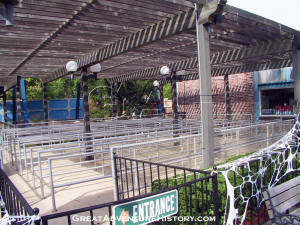 The Tilt-A-Whirl moved across the park to the Hernando's Hideaway area. 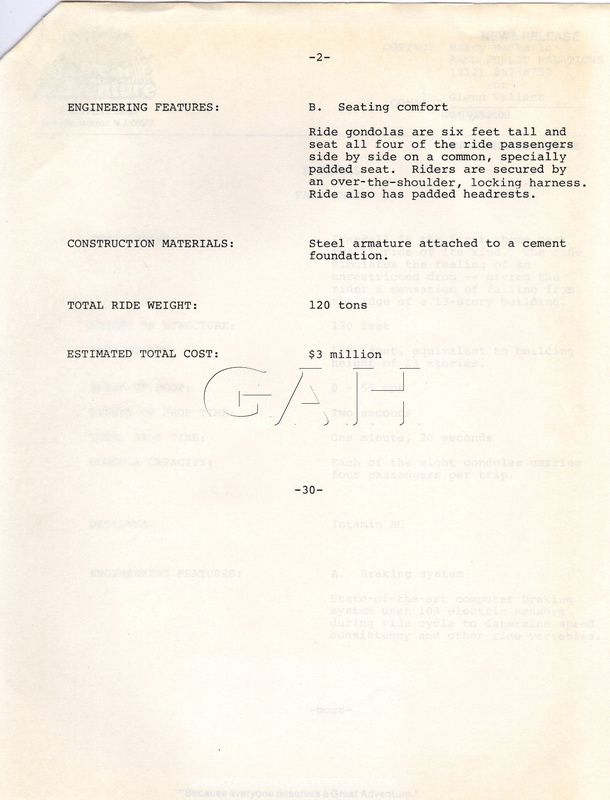 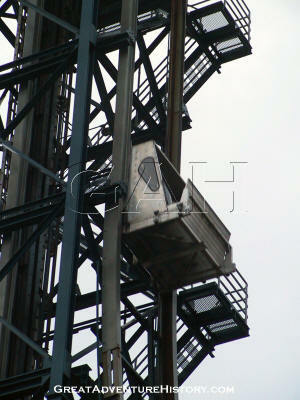 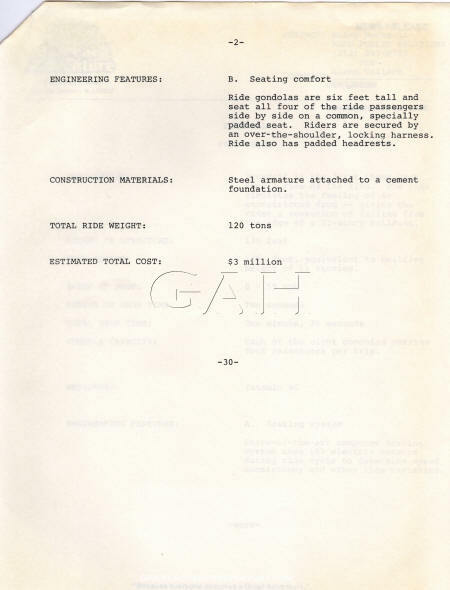 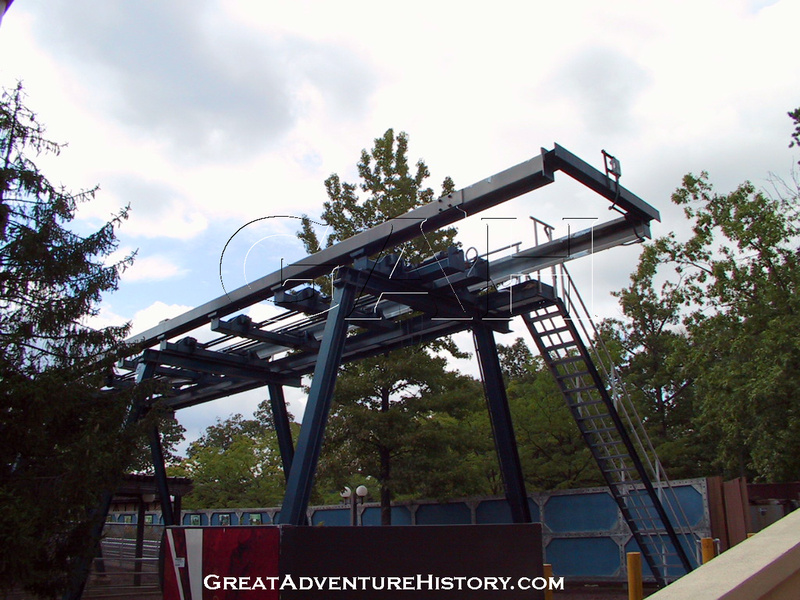 The rides which were originally designed for portability were relatively easy to move. 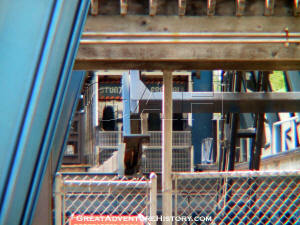 A shooting gallery that had been located on the site was torn down completely. 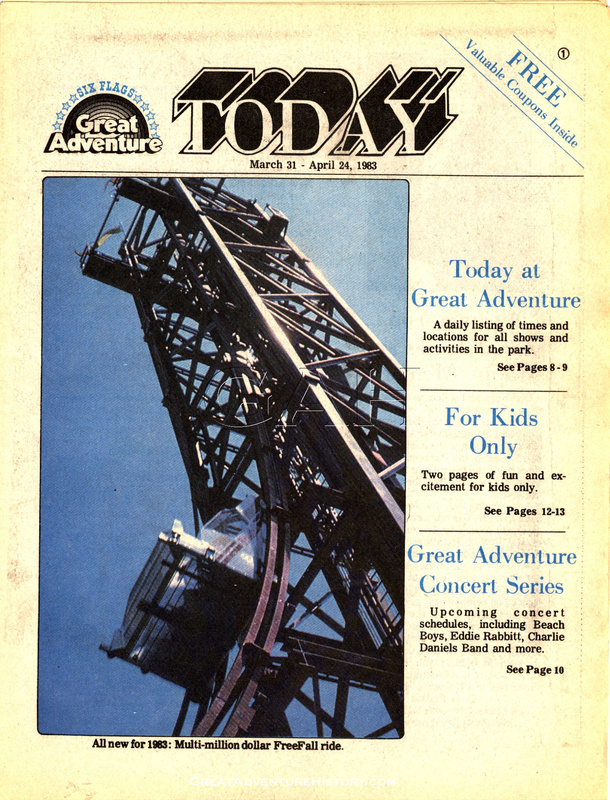 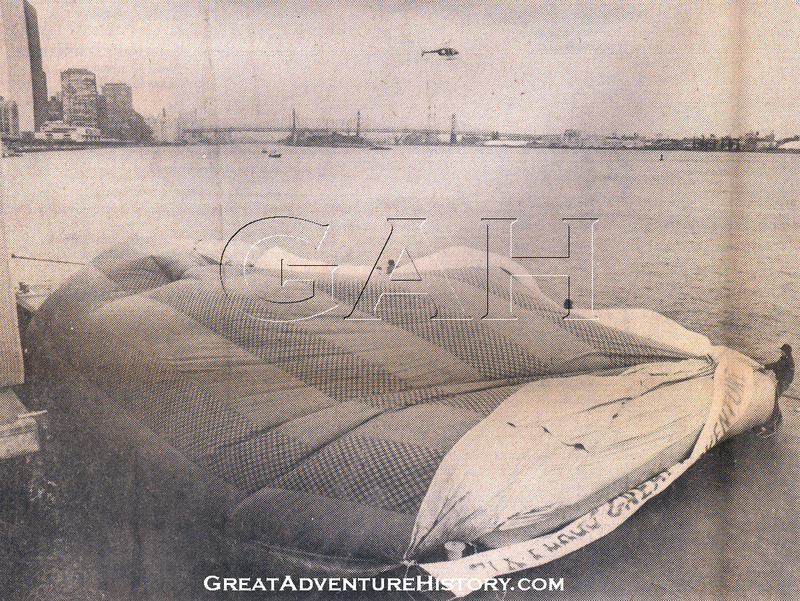 To promote the opening of Freefall at Great Adventure in the spring of 1983, a stunt man performed a jump for the media into an air bag in New York Harbor. 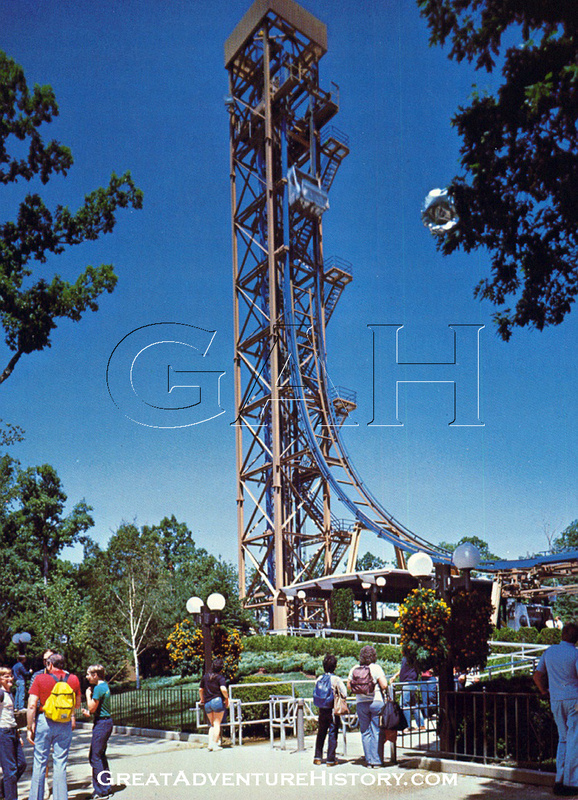 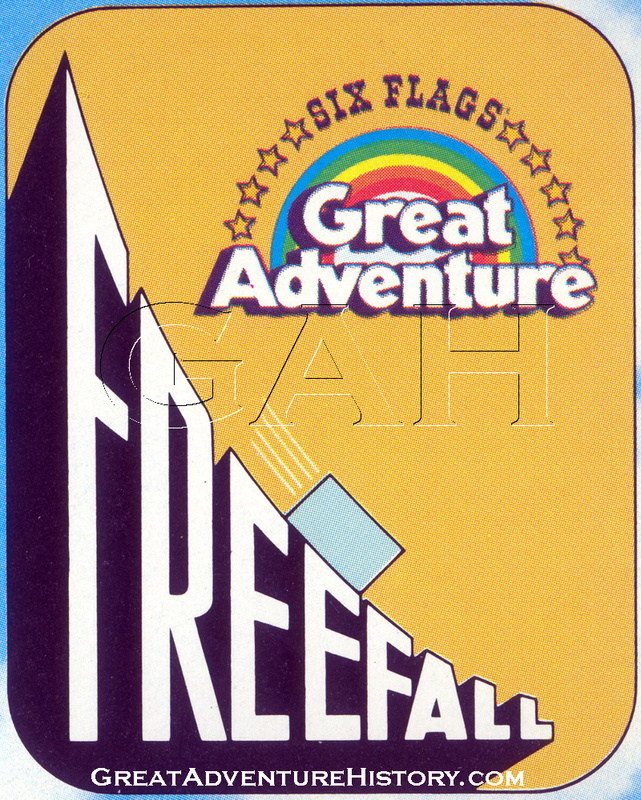 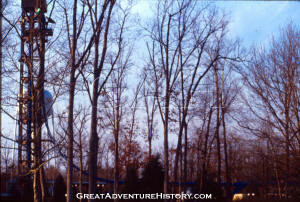 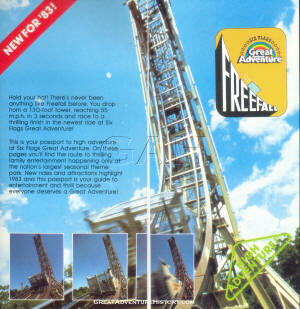 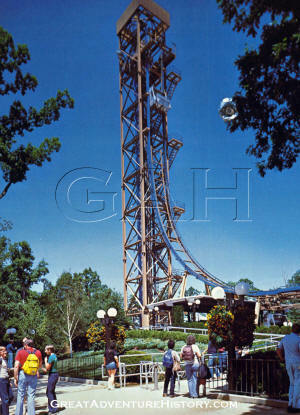 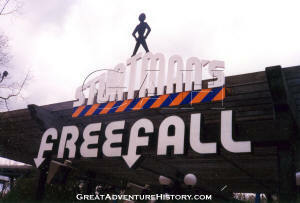 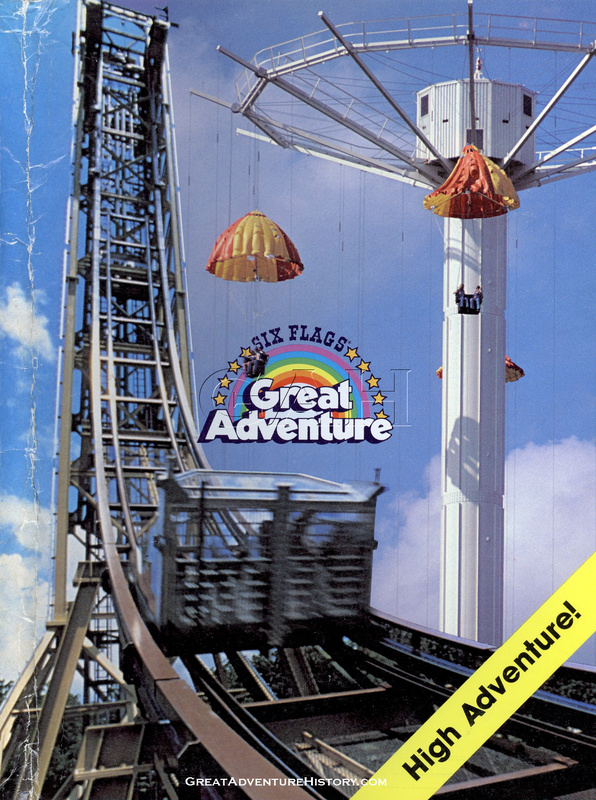 Freefall was one of three new attractions added to Great Adventure for 1983 as the park's attendance blossomed. 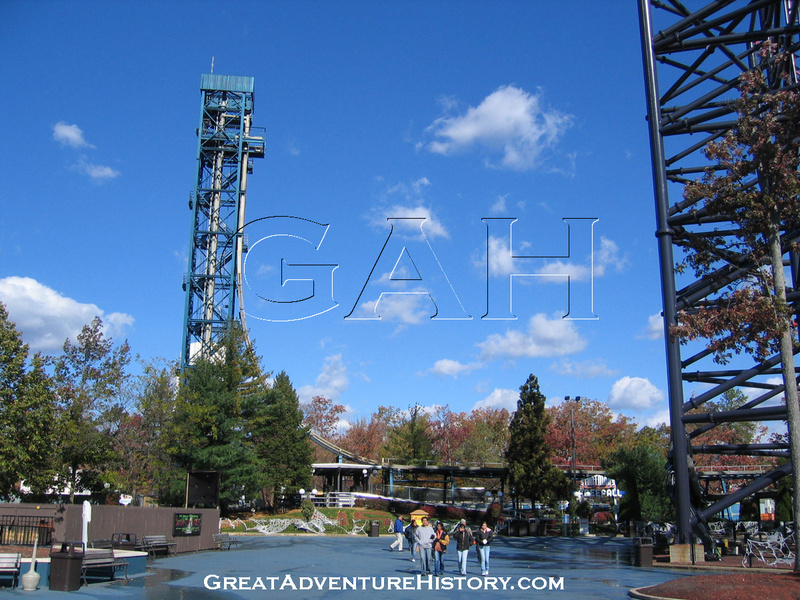 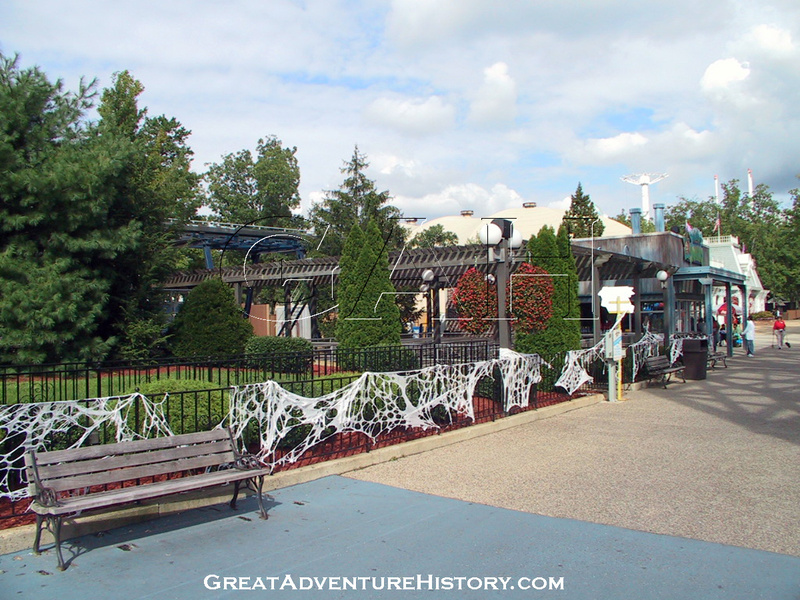 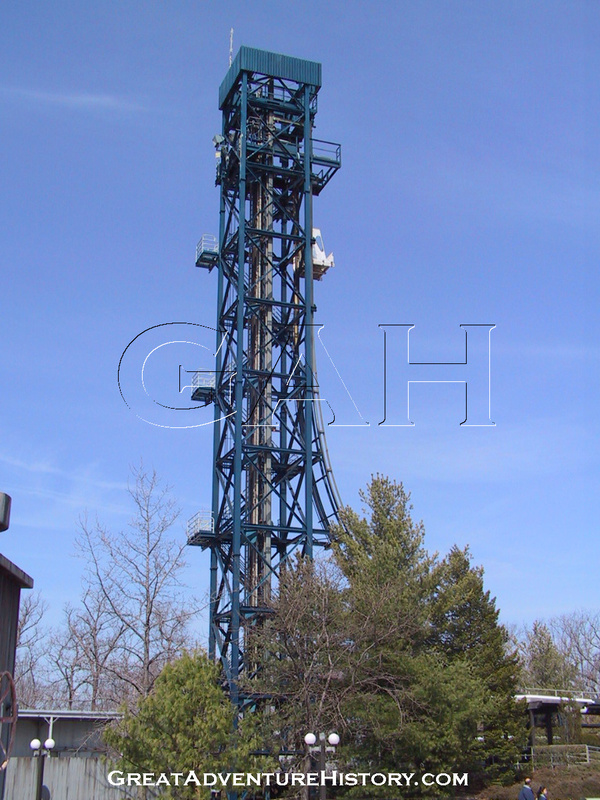 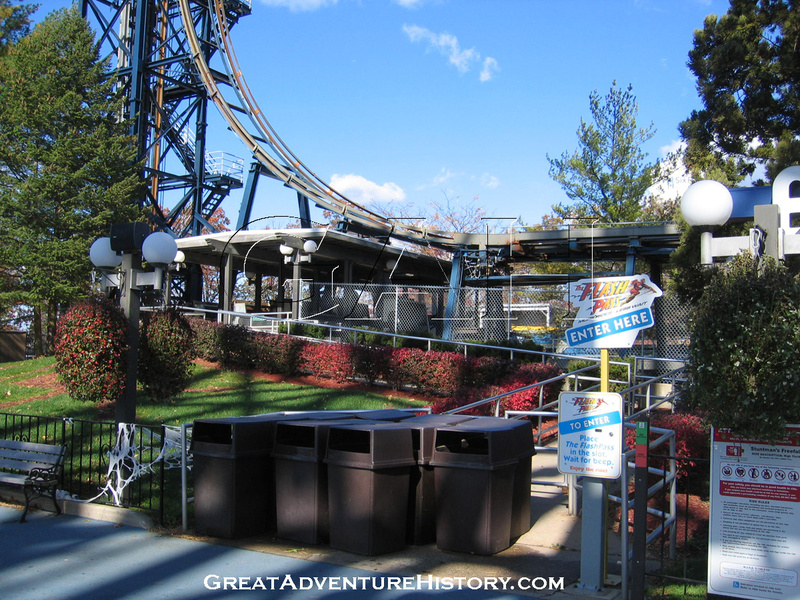 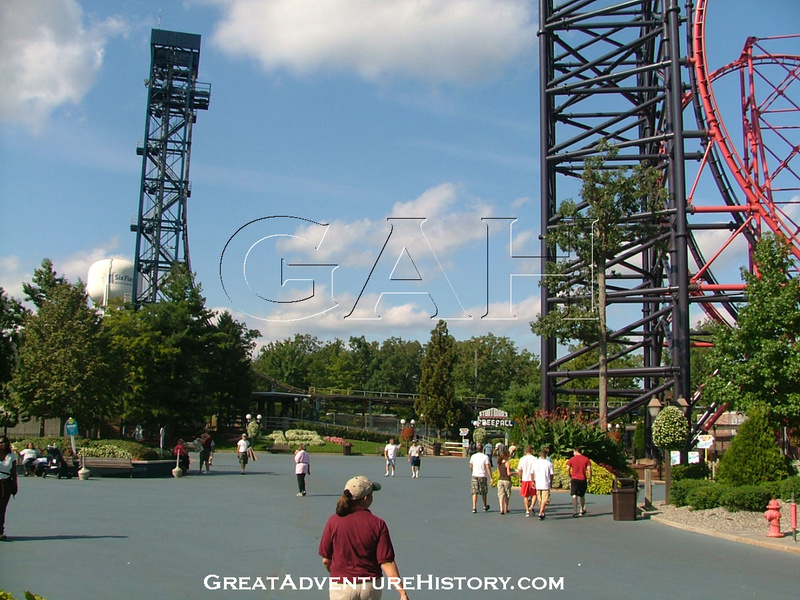 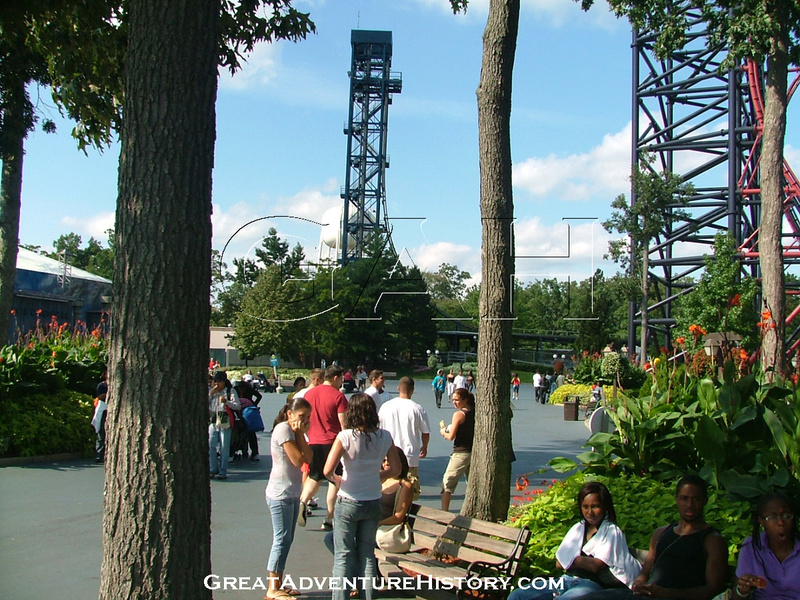 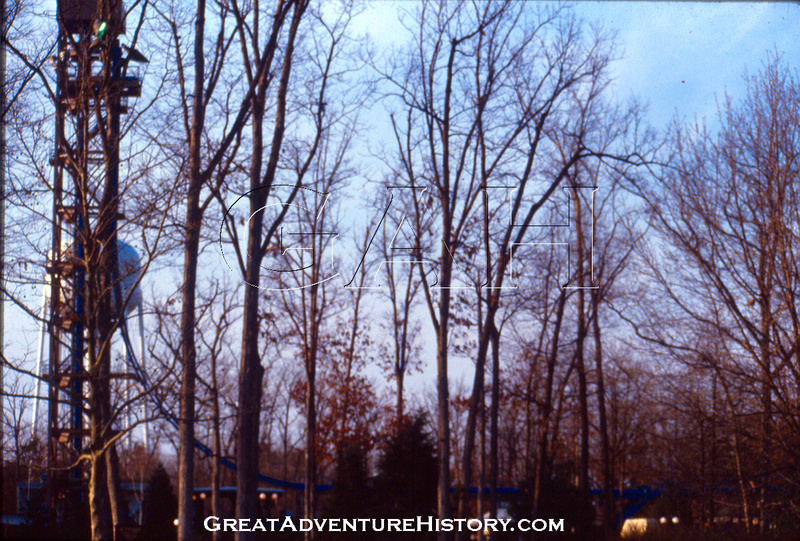 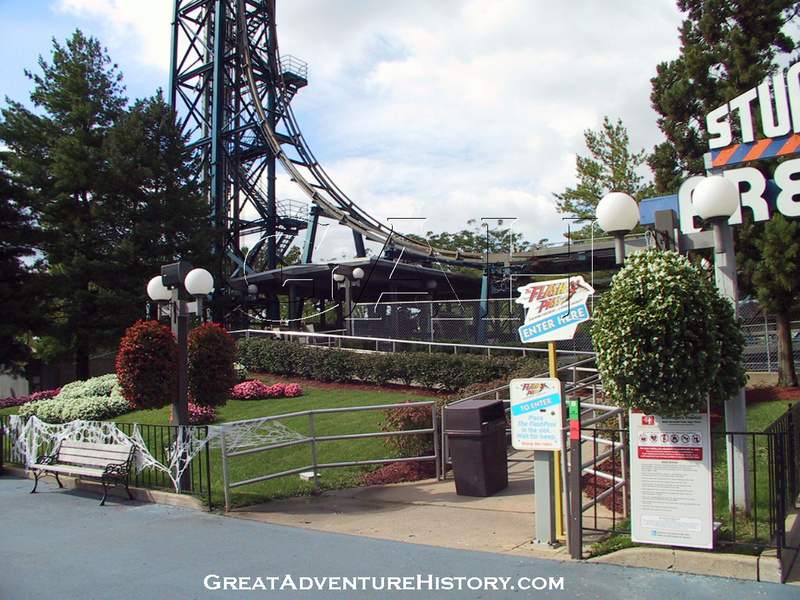 Also added that season were the Parachuter's Perch which was another INTAMIN ride which offered a thrilling experience, and the Great Lake Grandstand and ski show to round out the park's offerings and increase capacity. 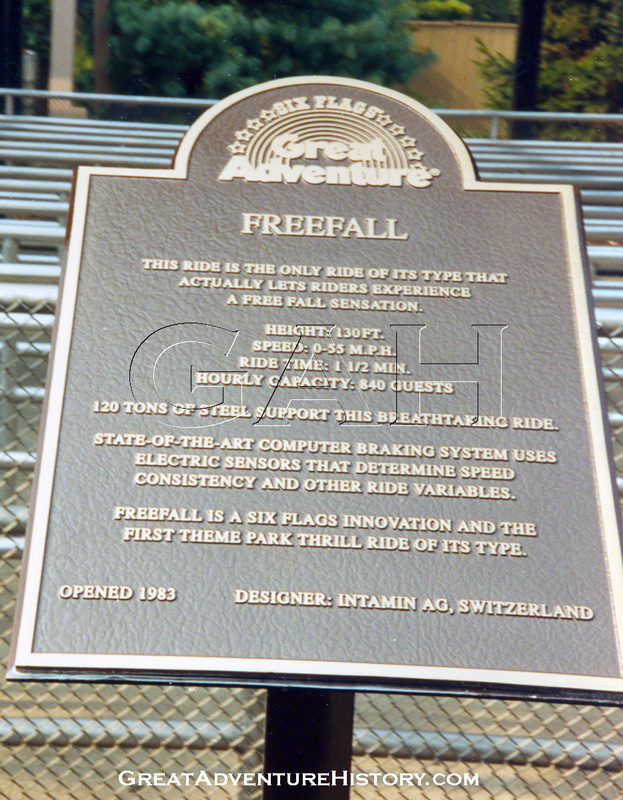 Freefall opened to huge crowds who waited on long lines for the very brief ride, who would often get off and get back on line for another ride. 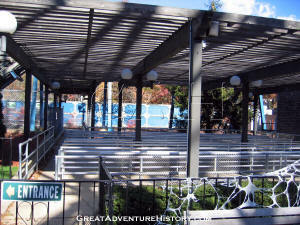 The large queue for Freefall was covered with a pergola to help provide some shade for the long lines of guests. 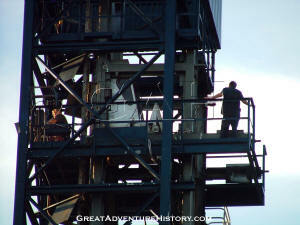 Waiting guests could look up to the tower as the cars would drop, further building the anticipation. Guests passed under the run-out track and brakes on their way to the loading station. Guests entered the station boarding the cars as they advanced through. The guests would be secured with simple shoulder harnesses giving a feeling of freedom and further adding to the fear of falling. The anticipation built as the cars continued to advance towards the lift with guests unable to see when their car would be lifted until it entered the tower shaft. 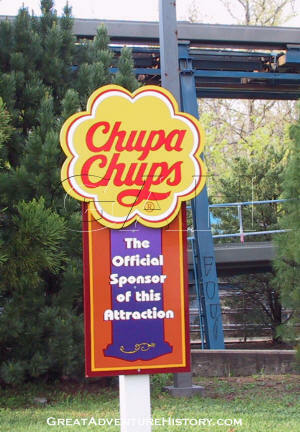 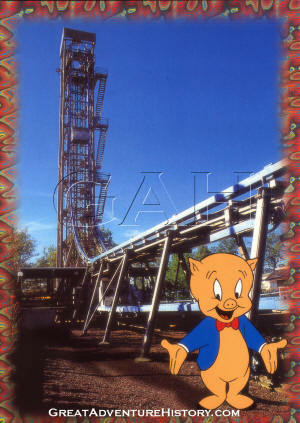 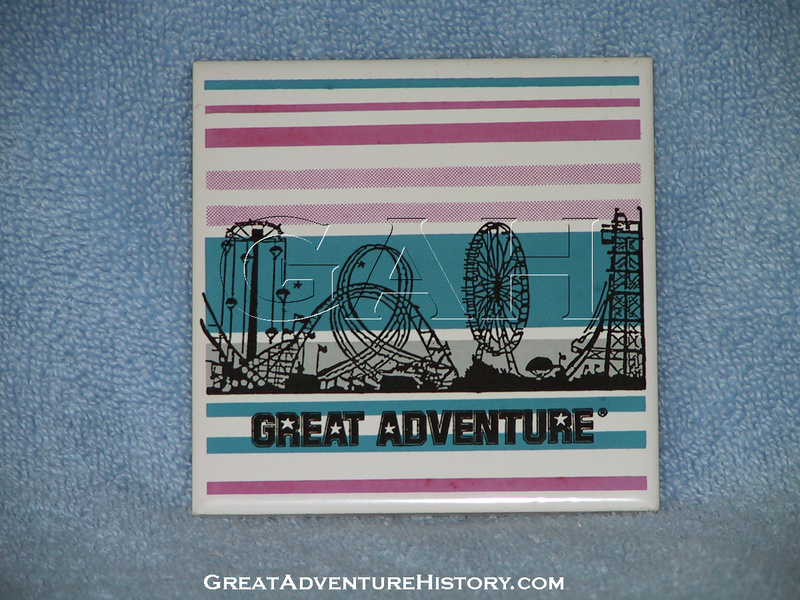 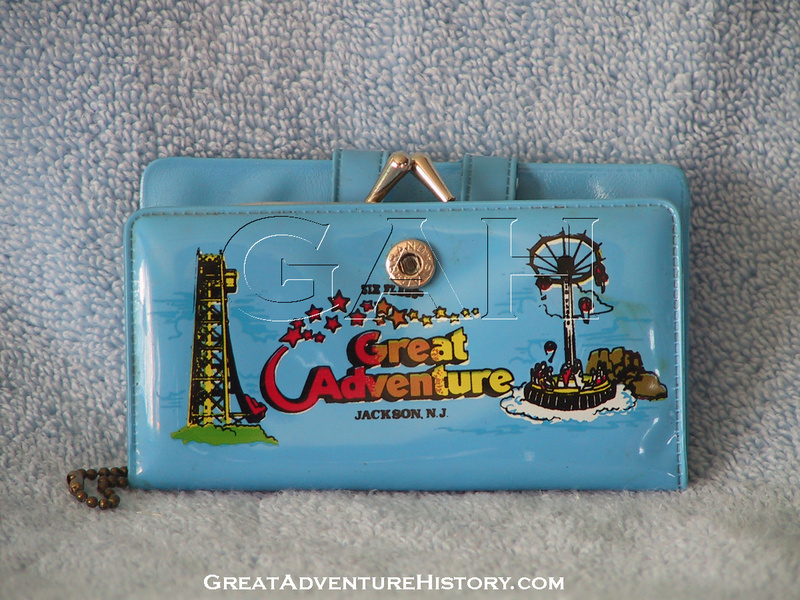 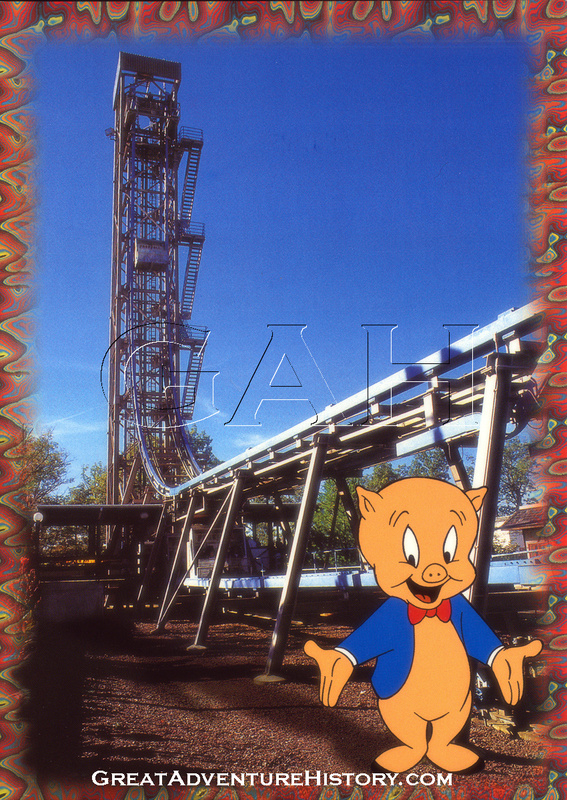 For the 1992 season the section of the park became Action Town and the following season Movietown, with all the rides in the section receiving new names and theme elements. 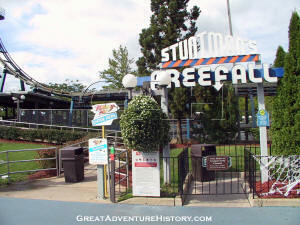 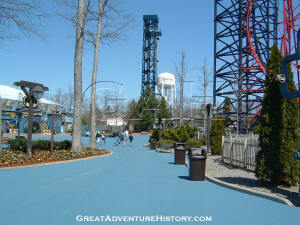 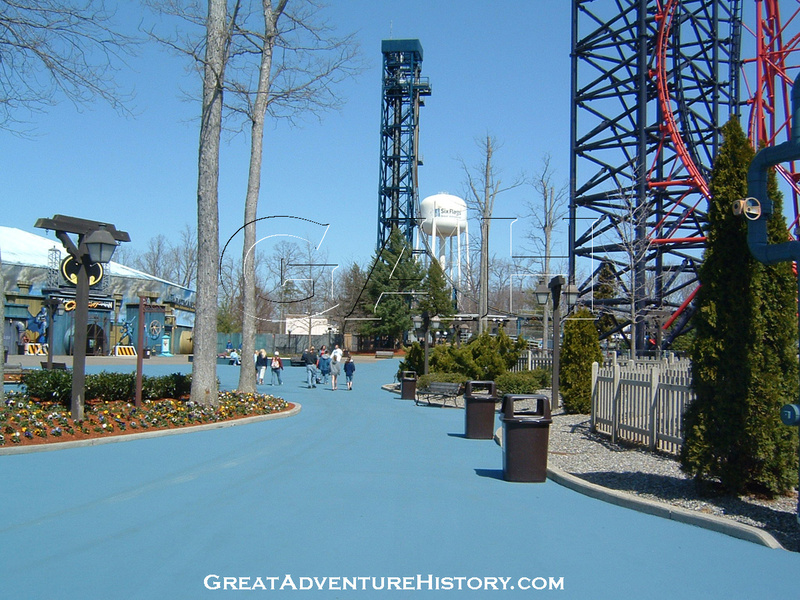 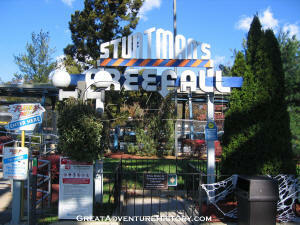 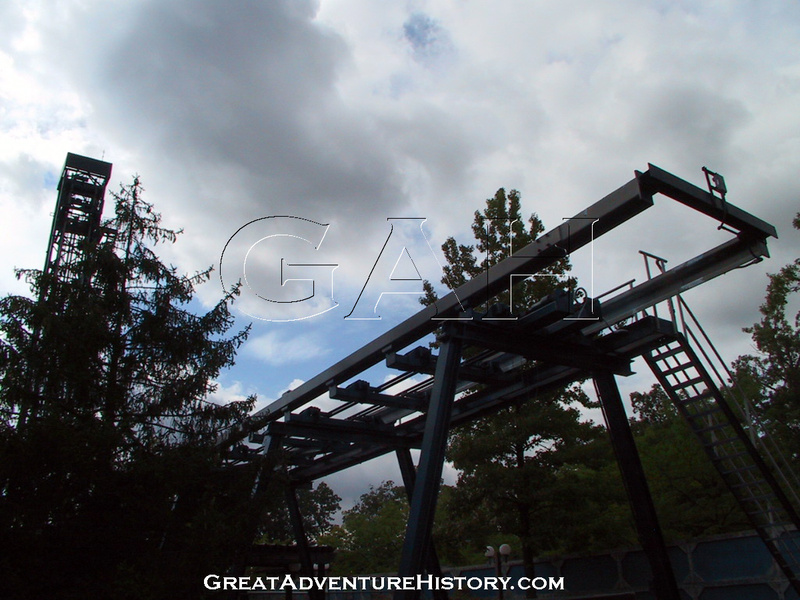 Freefall got a fresh coat of paint in more industrial gray and blue, and received the name Stuntman's Freefall. 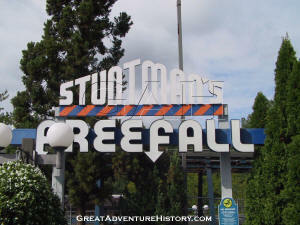 Next to Freefall, the new Stunt Arena took shape, and at the the other end a new restroom facility was constructed. 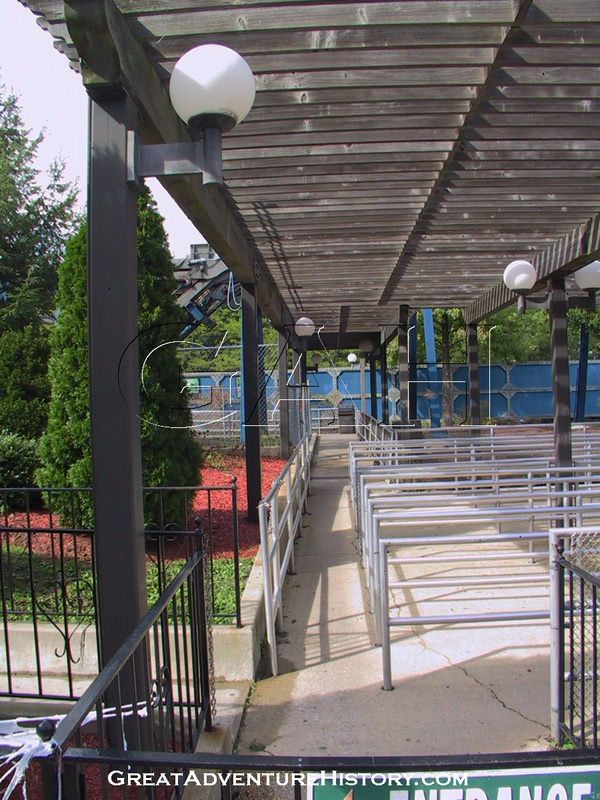 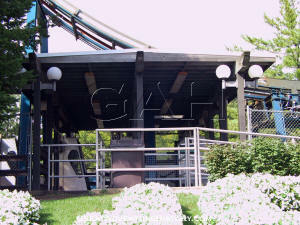 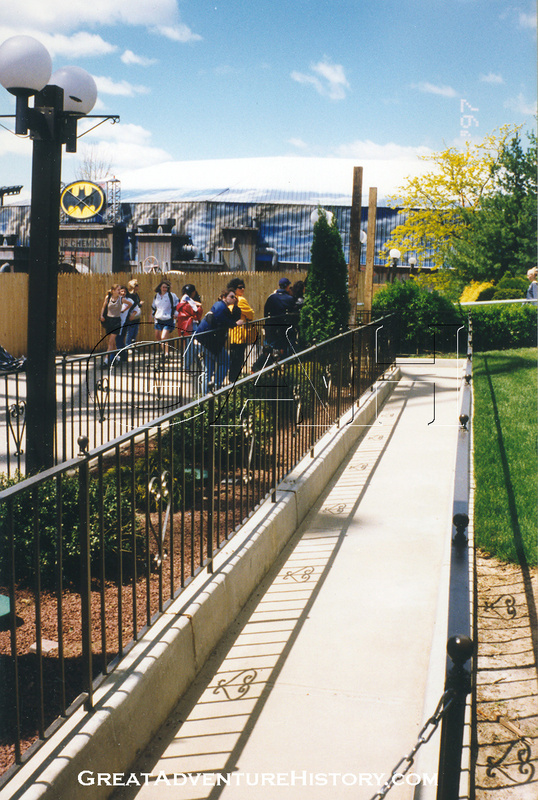 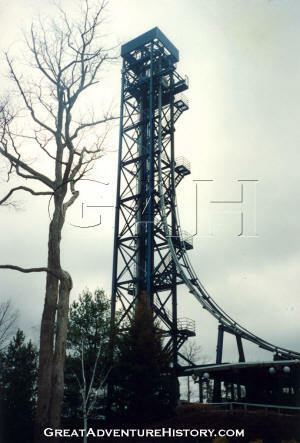 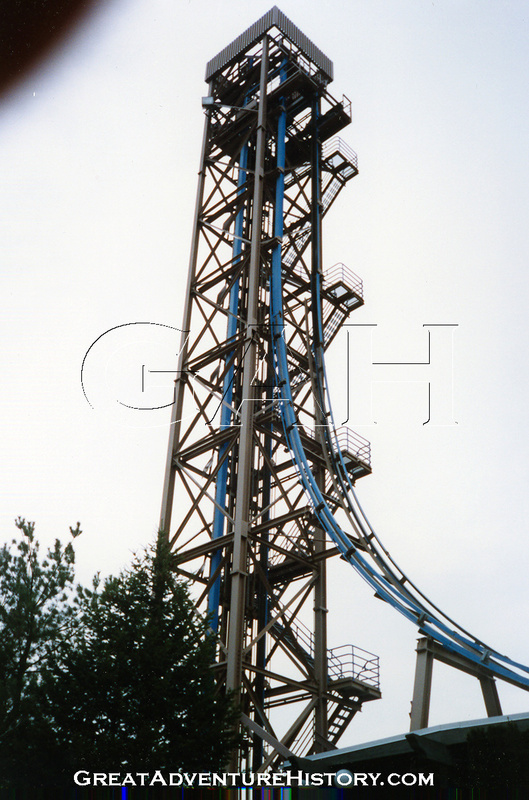 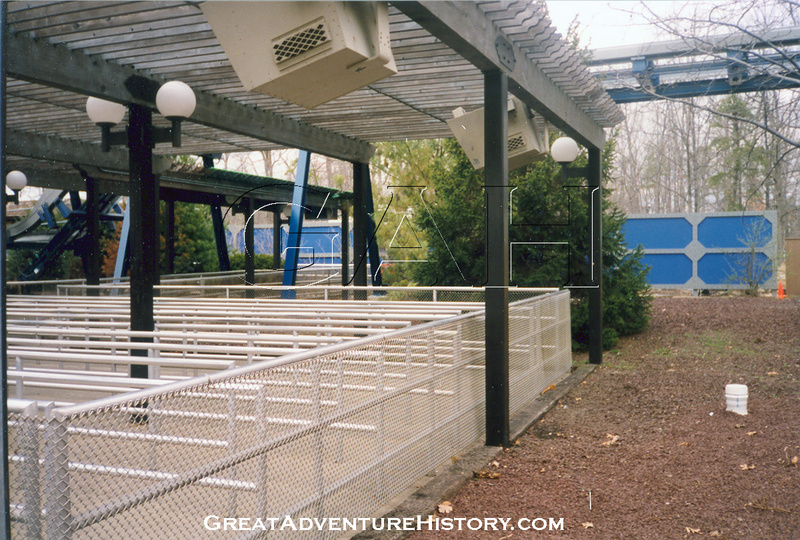 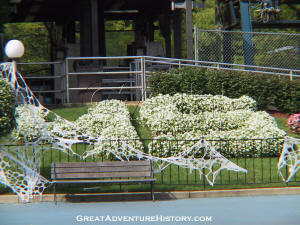 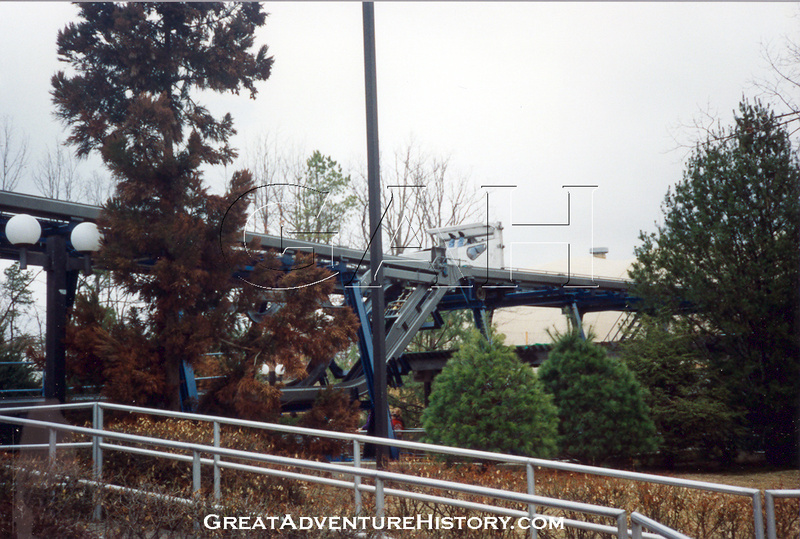 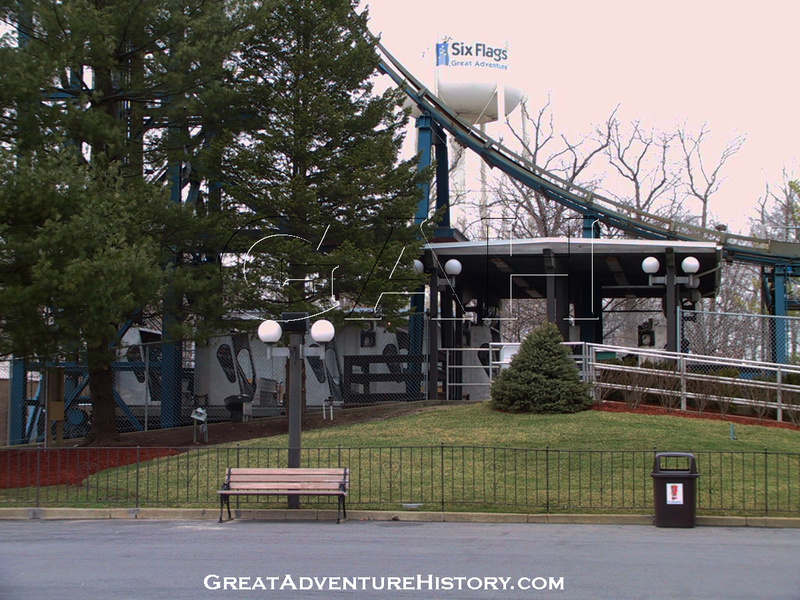 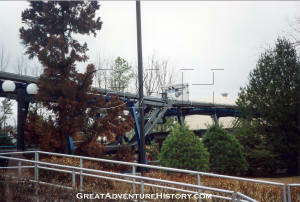 For the 1997 season, the area in front of Freefall was made over completely with the addition of Batman & Robin: The Chiller. 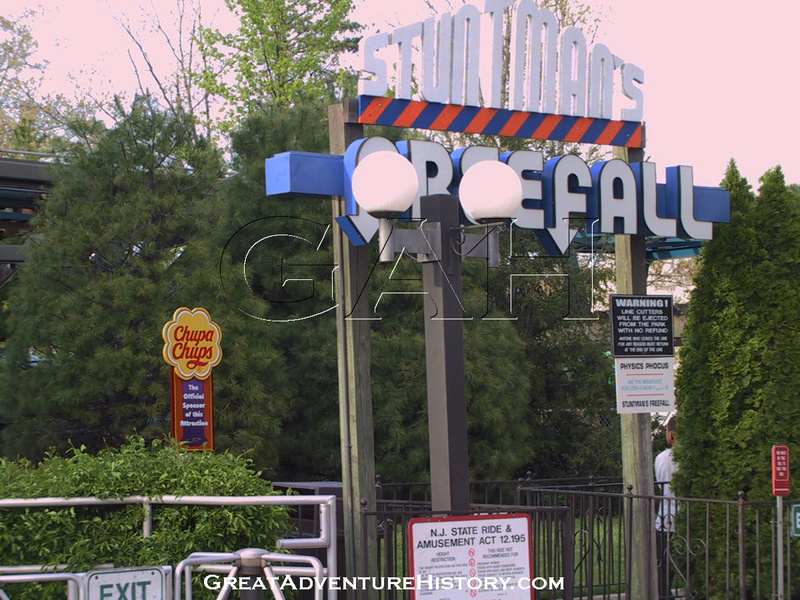 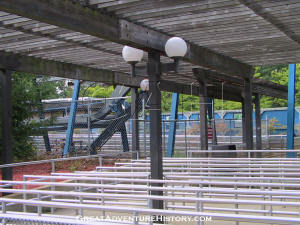 Freefall's entrance was moved down the path and closer to the ride's exit with an additional sidewalk being added to bring guests into the existing queue house and allowing for the construction of the new Snowy's Snacks building. 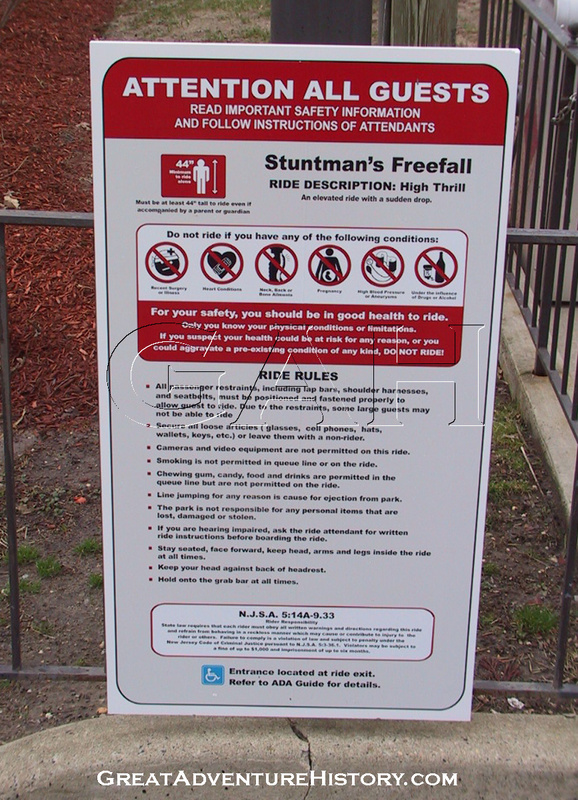 Safety Restraints: Over the shoulder locking harness with padded headrests. 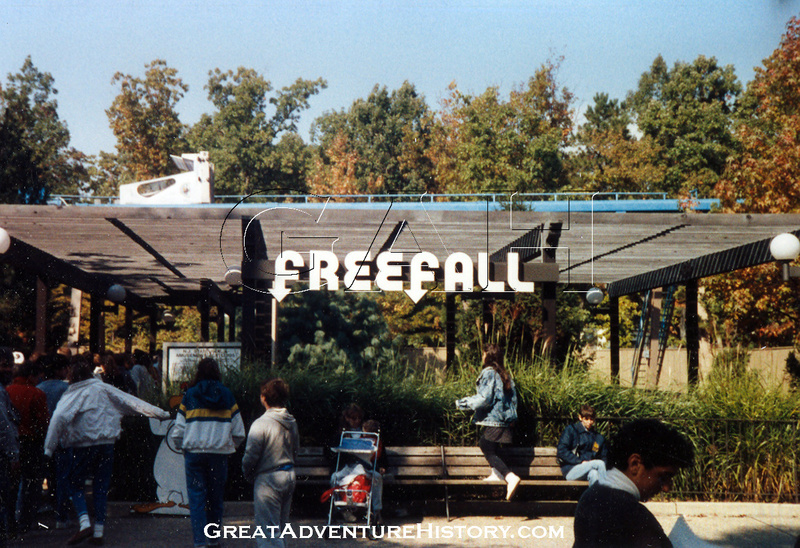 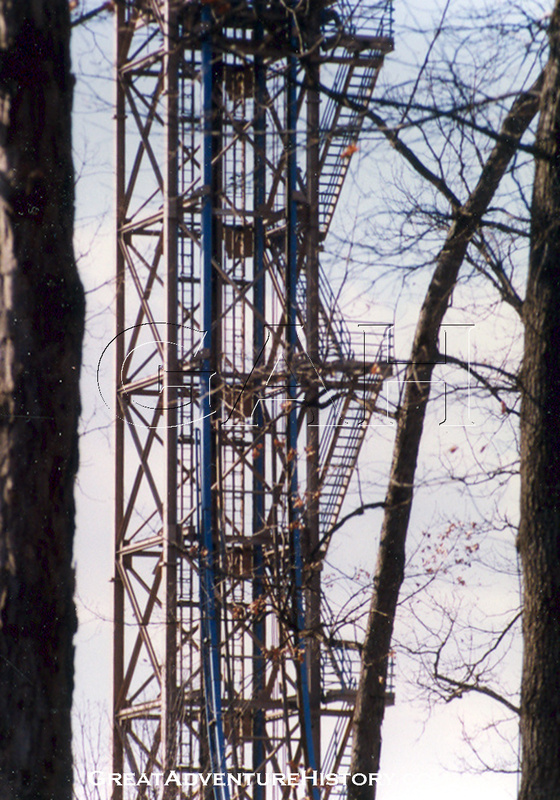 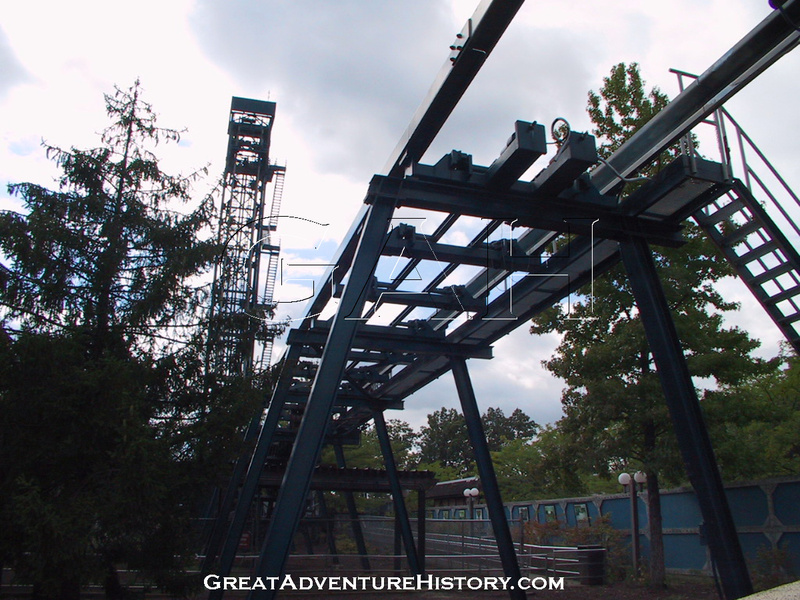 Perhaps the most lasting memory for riders on Freefall was the anticipation as the car reached the top of the lift and slowly rolled out toward the edge. 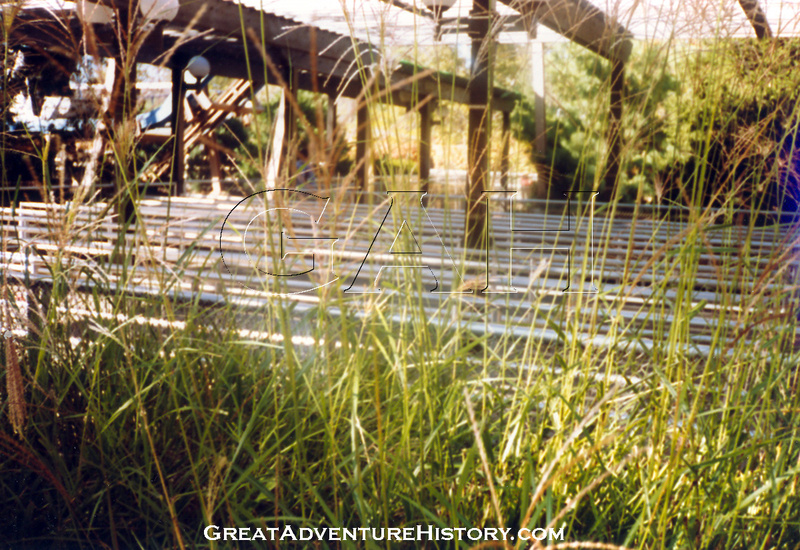 The view out to the end of the track and towards Showcase Theater took a backseat to the view straight down through the floor grate. 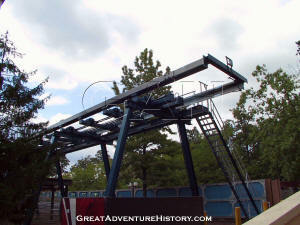 The car would sit for just a second at the end of the track as the track locked in preparation for the drop. 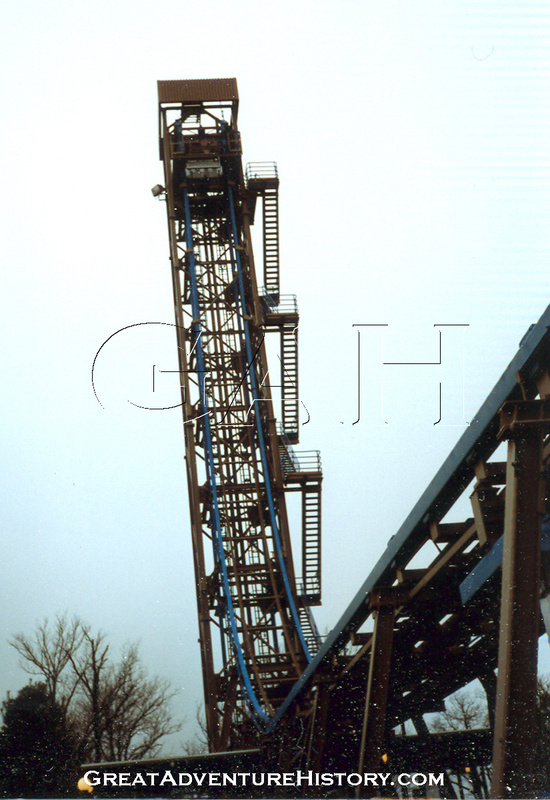 Finally after what seemed like an eternity to most people, a buzzer would sound and the car would plunge, pulling the riders down the 100+ foot drop for the approximately 2 seconds of true freefall before hitting the curved section and the brakes staring skyward. 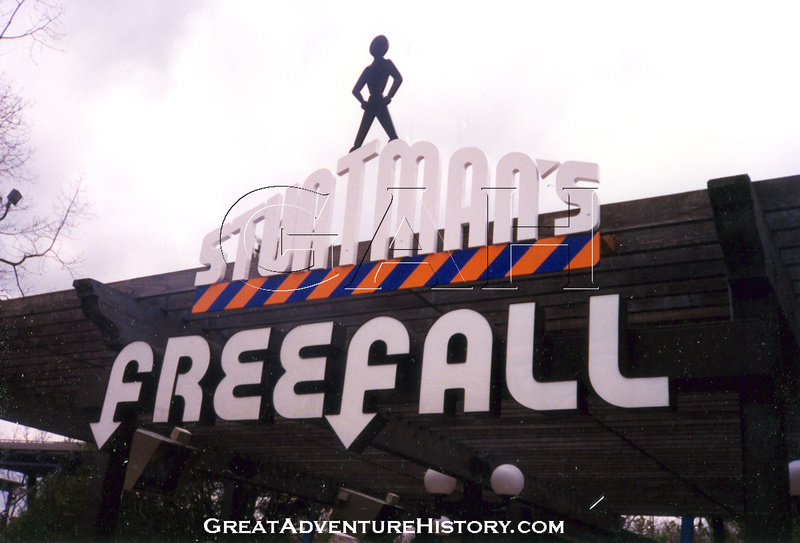 As time passed and bigger and more modern rides were added to theme parks, the INTAMIN first generation freefalls began disappearing. 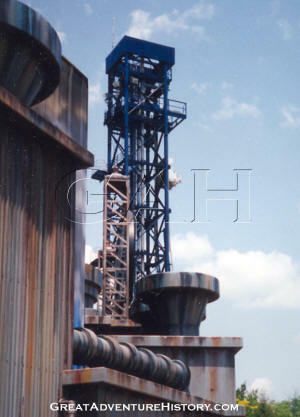 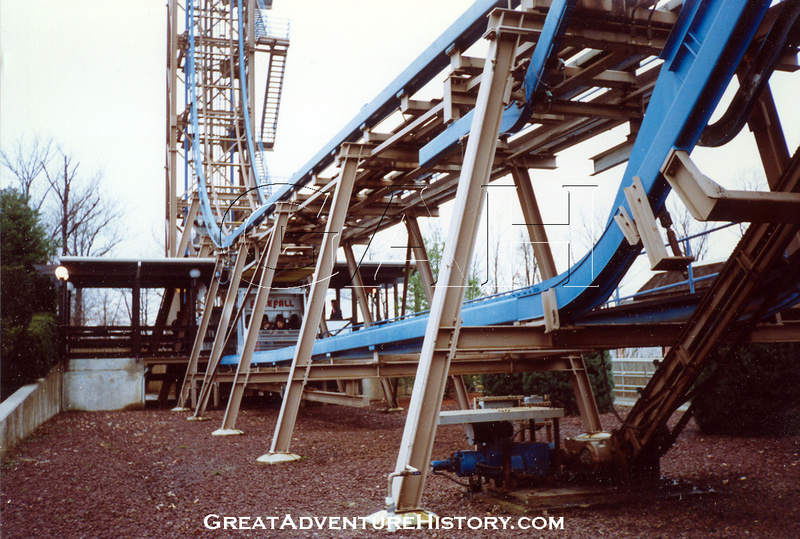 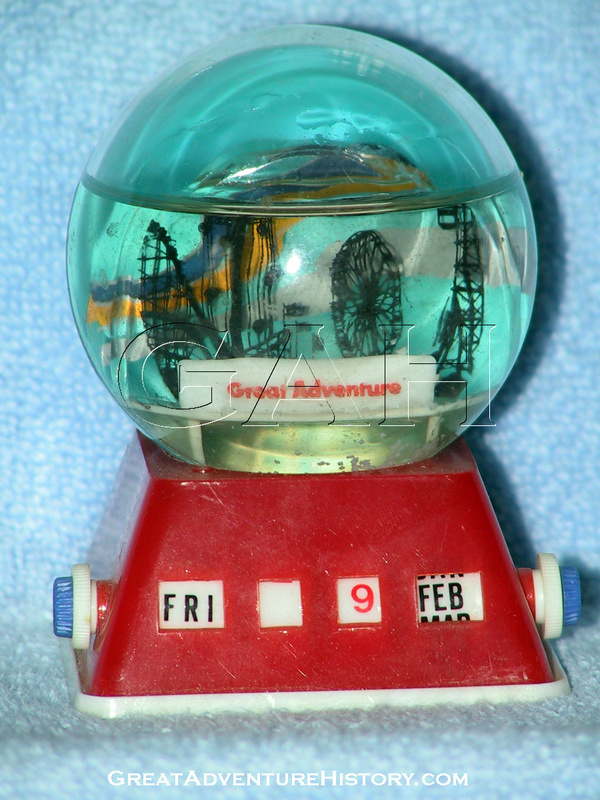 One of the first to go was Six Flags Astroworld's Sky Screamer, with parts going off to other Six Flags parks. 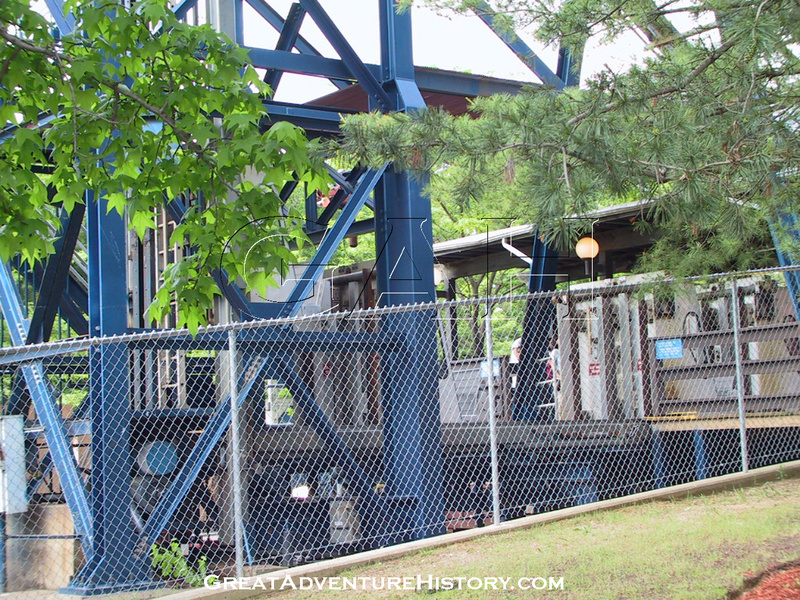 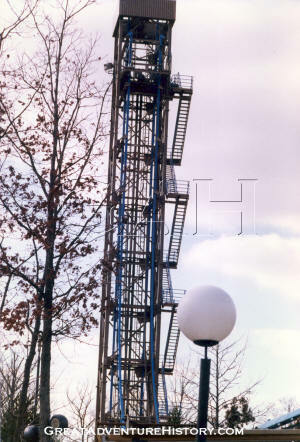 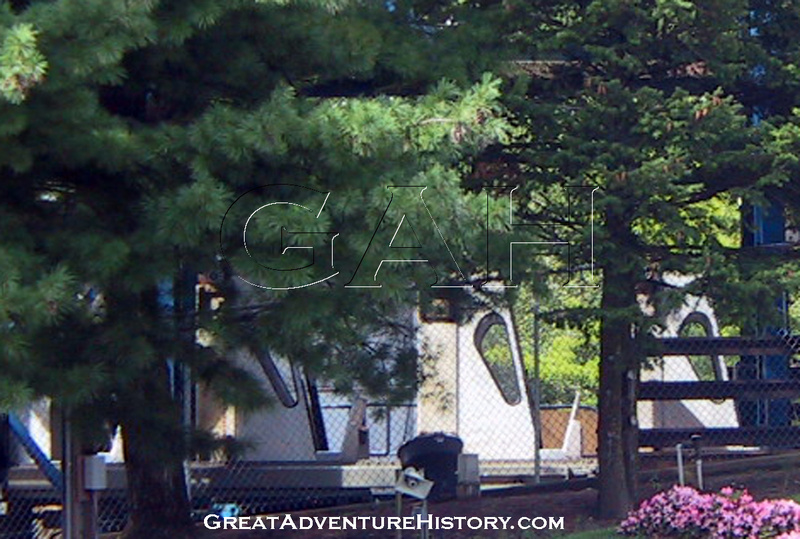 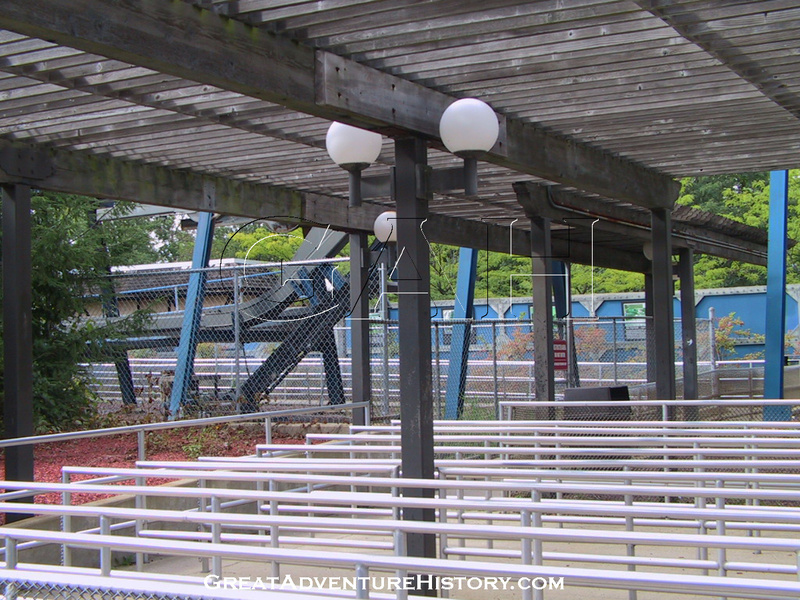 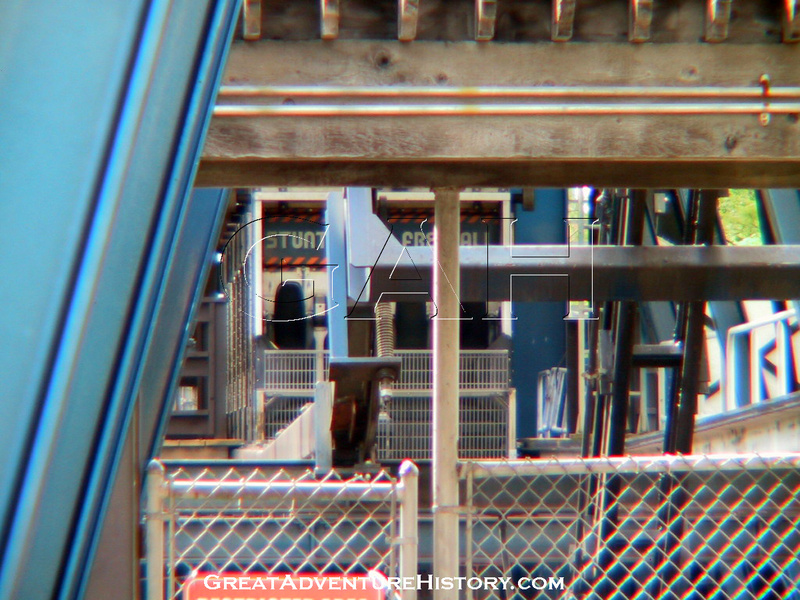 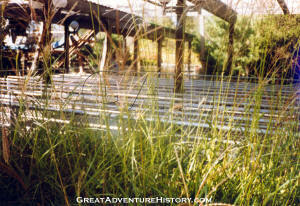 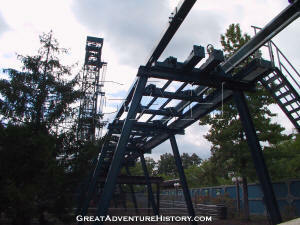 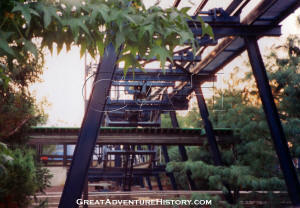 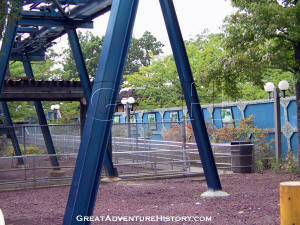 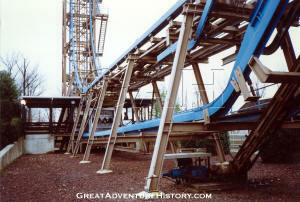 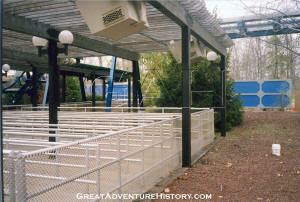 The Sky Screamer cars sat in the park's maintenance yard for many years, never being used on Great Adventure's ride. 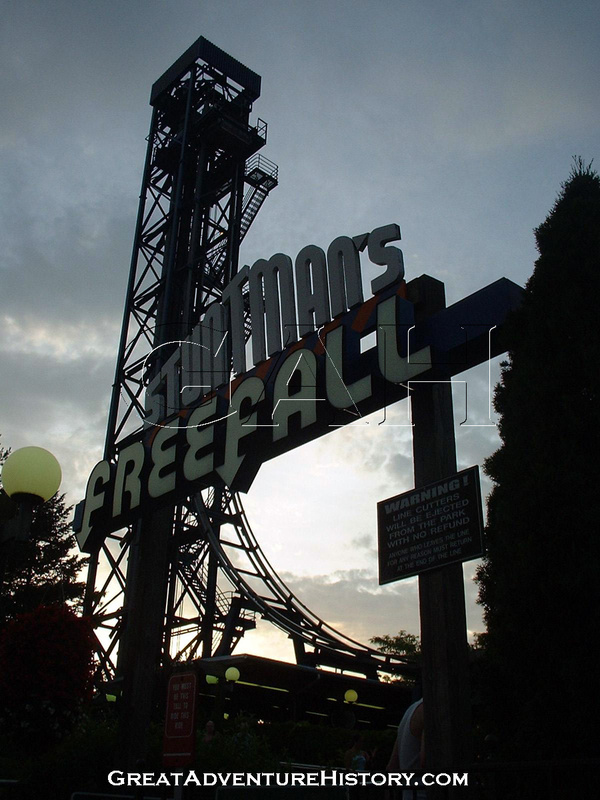 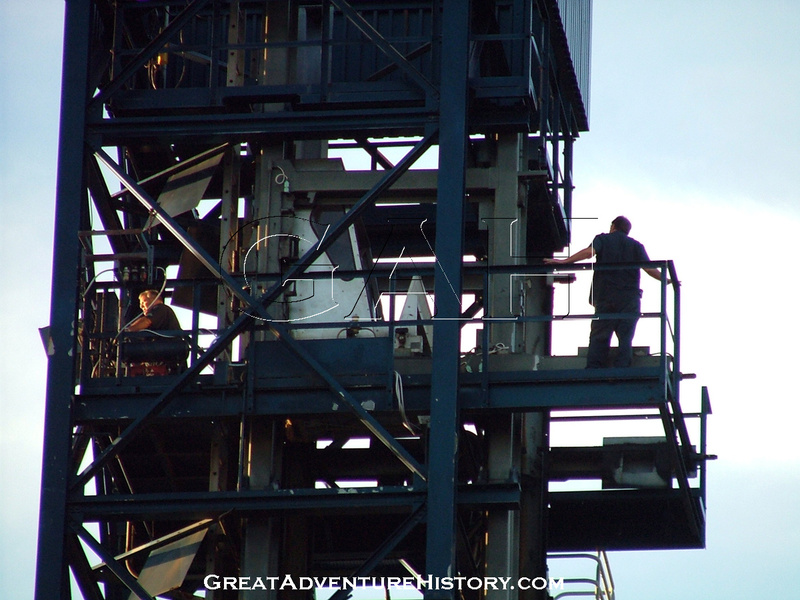 Over time first generation INTAMIN freefall rides began suffering more and more downtime as more parts began to wear out and require replacement. 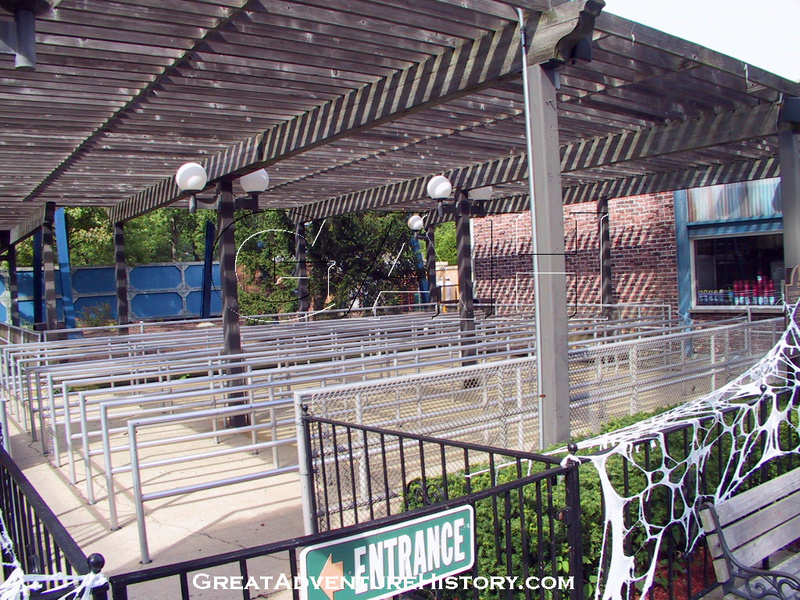 As costs mounted for keeping them running the writing was on the wall for all the remaining rides, with parks trying to sell them as rides or as scrap metal if no buyers were found. 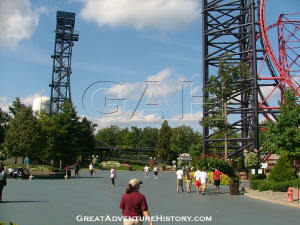 from Six Flags Great Adventure? 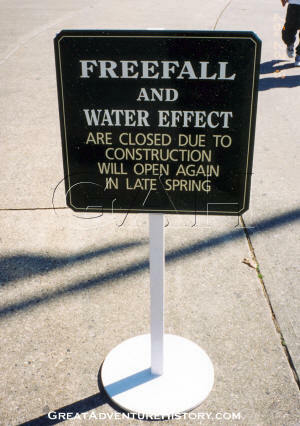 We'd love to share it in the Galleries! 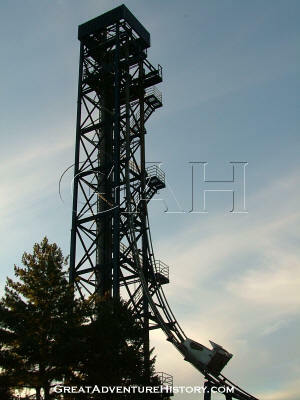 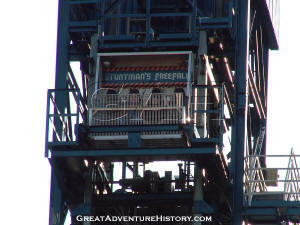 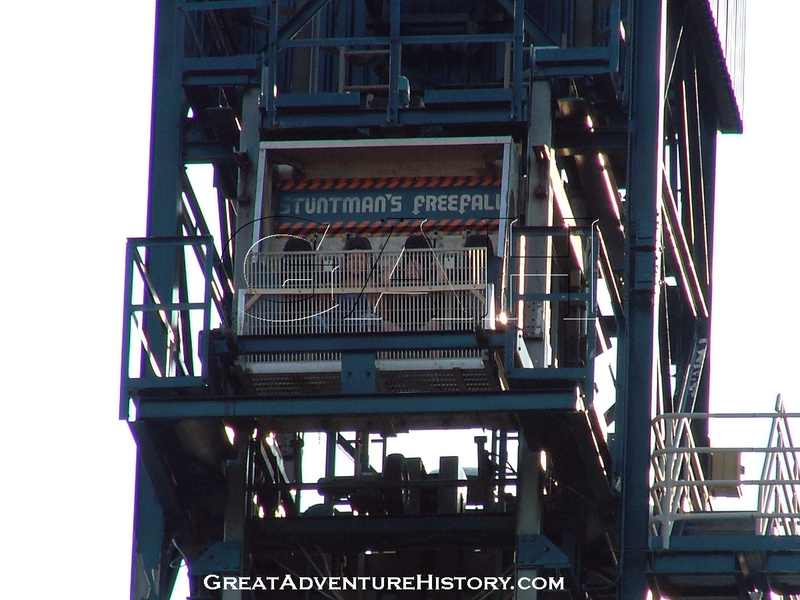 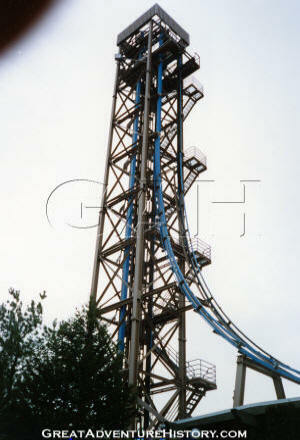 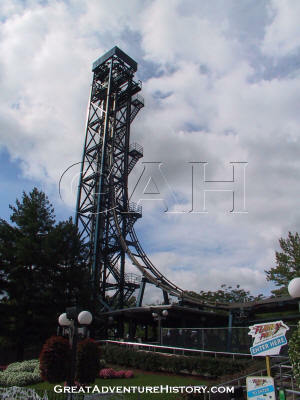 Throughout the 2006 season Freefall suffered long periods of downtime as the problems increased and budgets shrank. 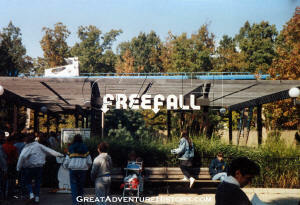 By midway through the summer, Freefall was listed as "Closed for the Season", but was sporadically reopened for the last two months. 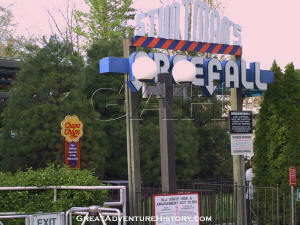 Increasingly it was looking as though Freefall would be leaving the park, and after the park had closed for the season, the ride was demolished and sold for scrap. 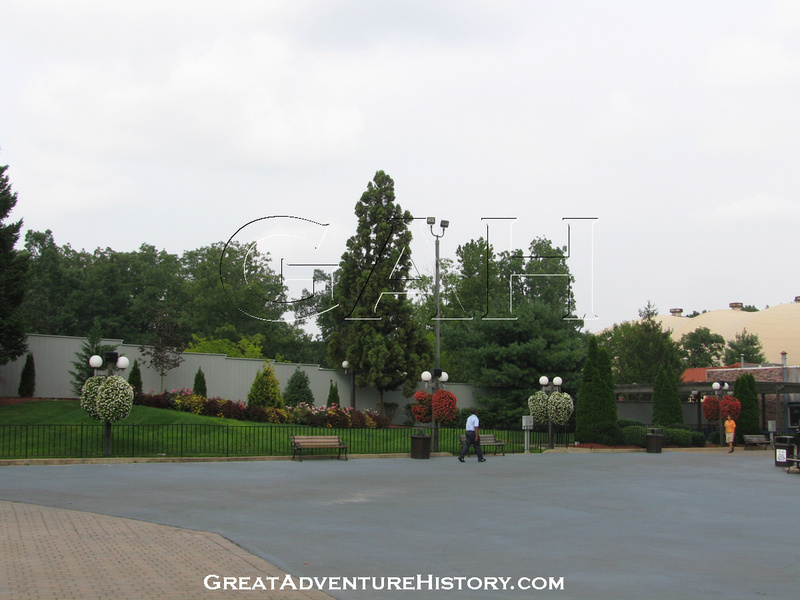 The spot which had so long been one of the park's most recognizable landmarks was now vacant with no budget for a replacement attraction in sight. 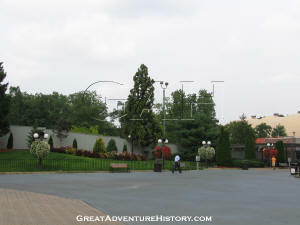 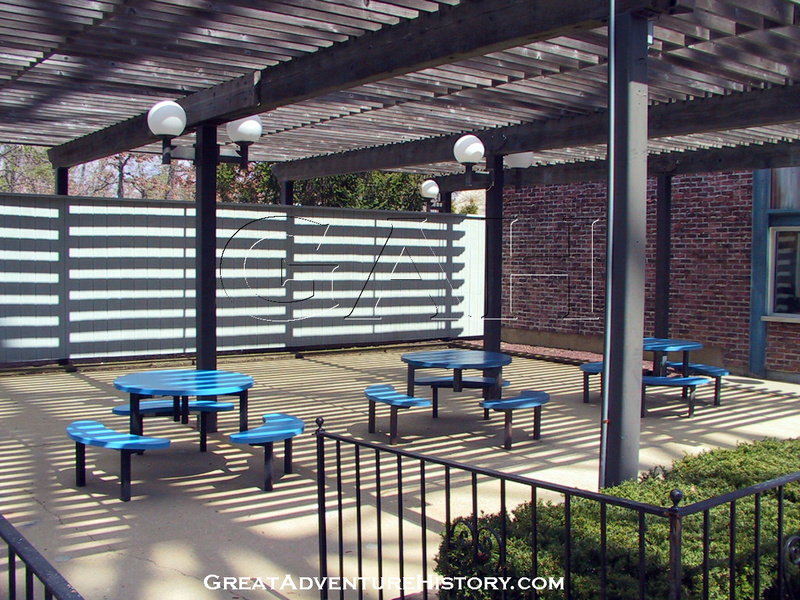 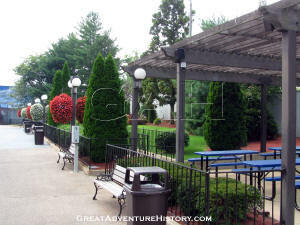 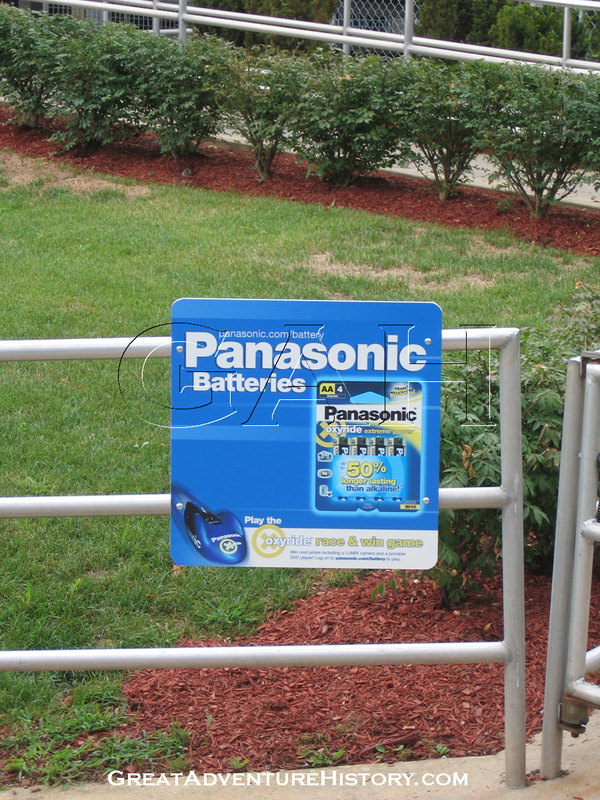 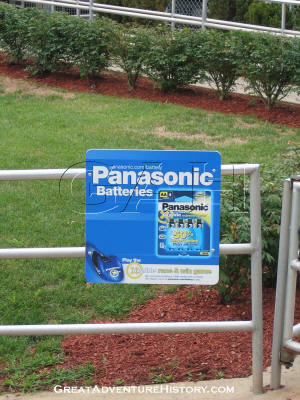 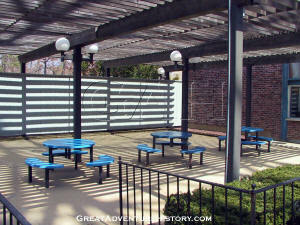 The former Freefall site became a landscaped barrier between the park and the backstage areas of the park. With the removal of Freefall and then the removal of The Chiller the following season, the area of the park became very quiet. 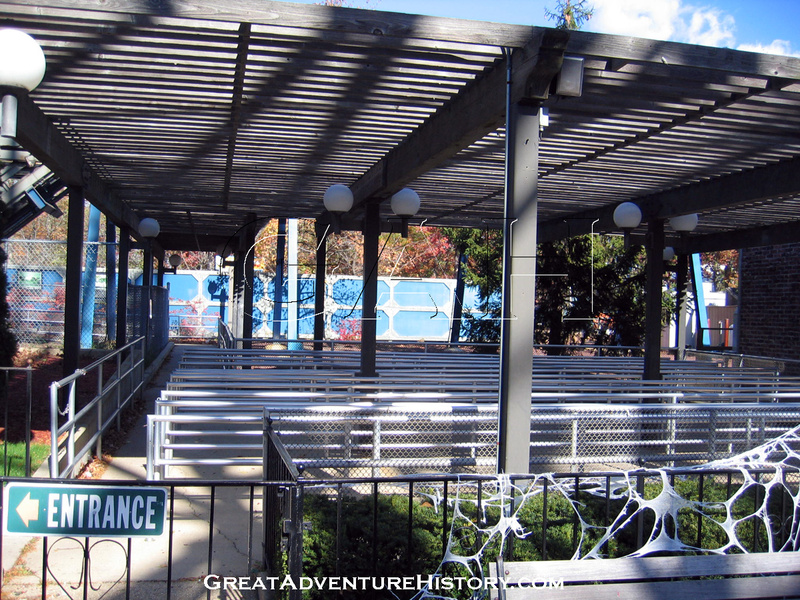 The former queue are became a patio for Snowy's Snacks. Eventually it is anticipated the area will be redeveloped with new attractions.